​Below is a selection of arrivals, departures & quayside shots arranged in reverse chronological order. 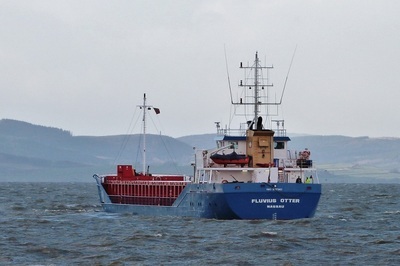 Outbound for Ayr having unloaded a shared cargo of fertiliser from Antwerp. 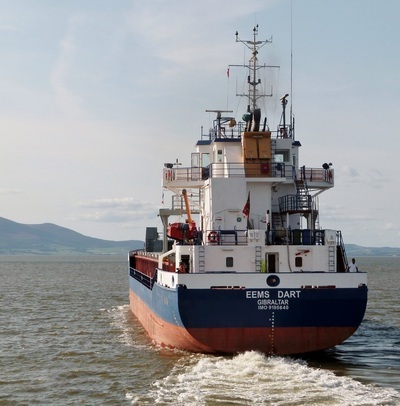 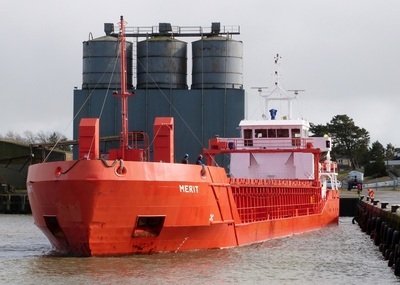 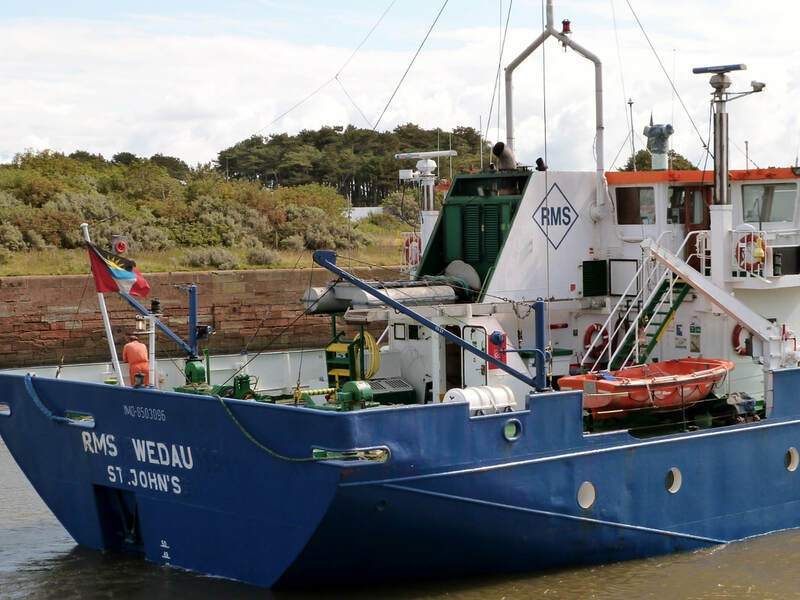 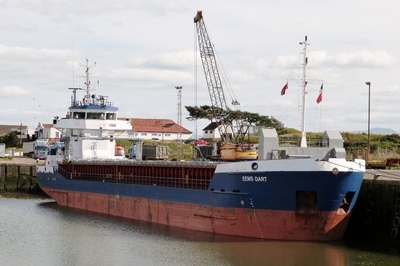 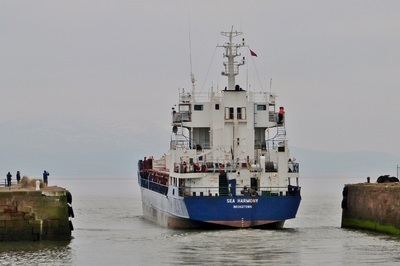 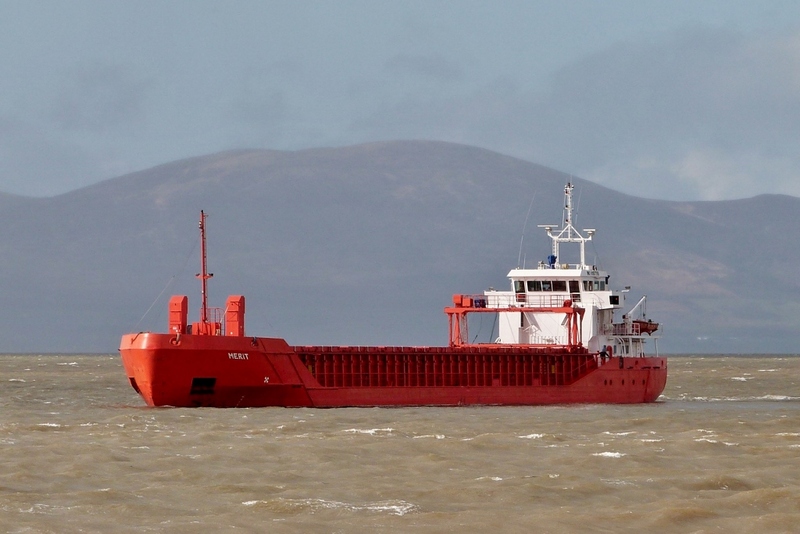 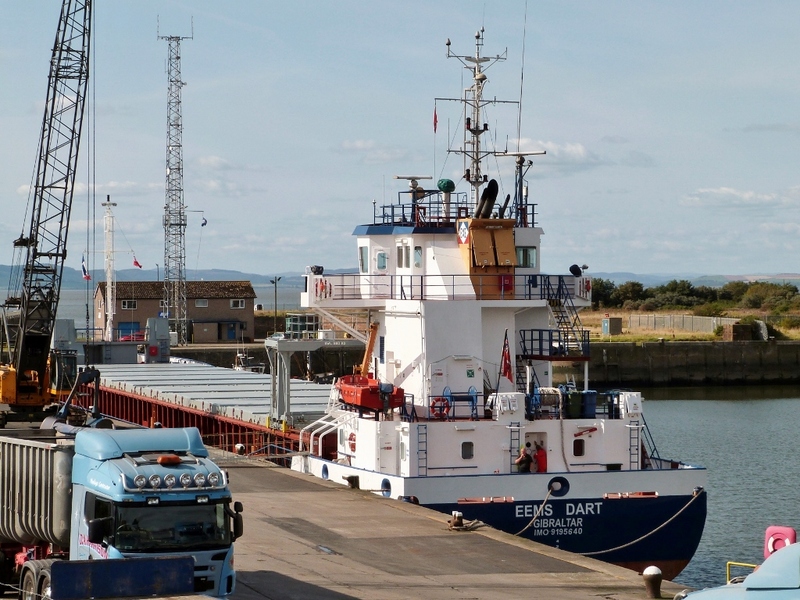 'EEMS DART' is owned by 'EXE Shipping', a small British company based in Exeter responsible for 9 ships. ​The company logo is displayed on the funnel & on a flag at the bow. 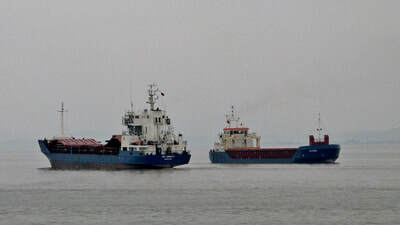 A busy morning with two ships entering the port on the same tide. The second vessel experienced difficulties at the port entrance illustrating the narrow time window available for entry. 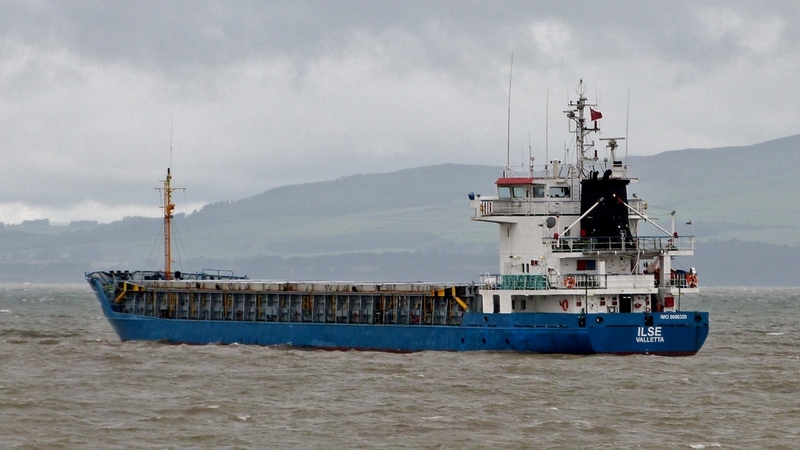 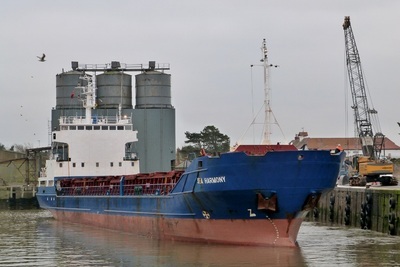 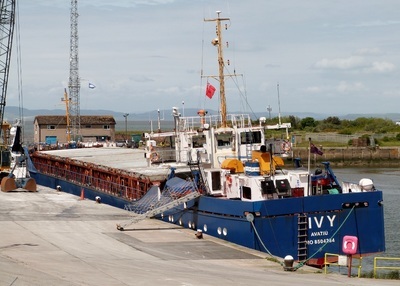 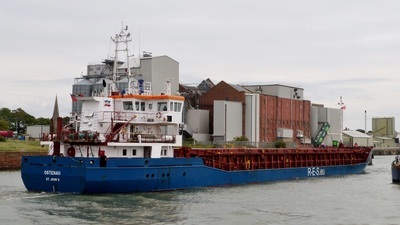 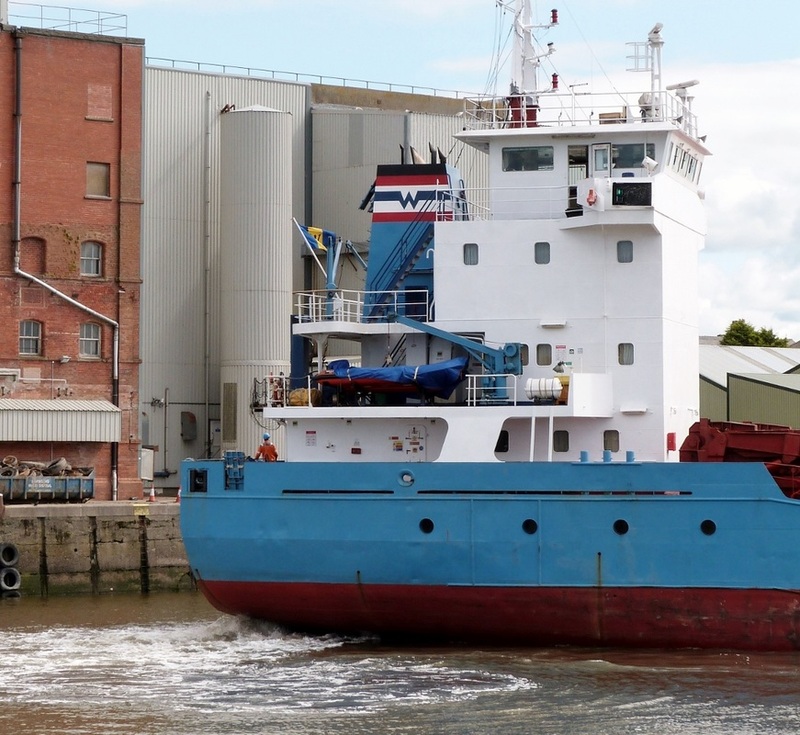 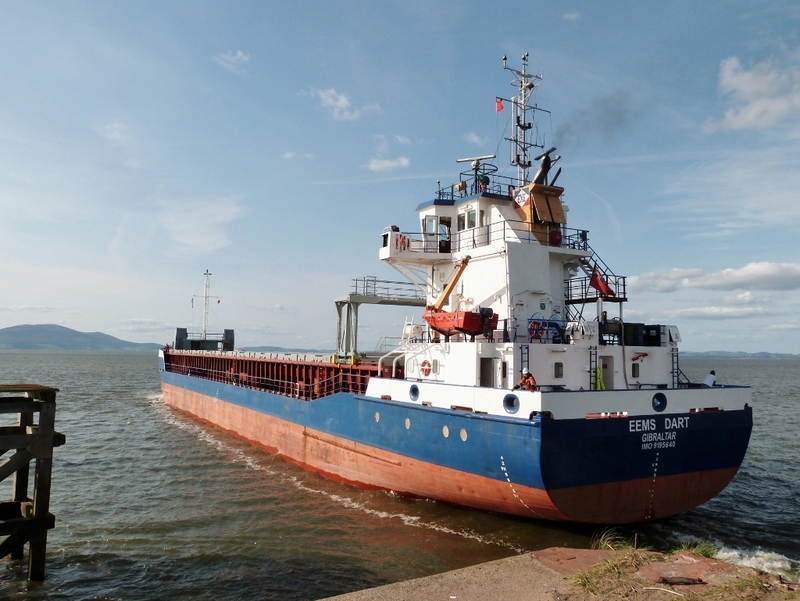 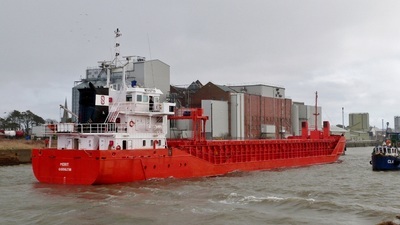 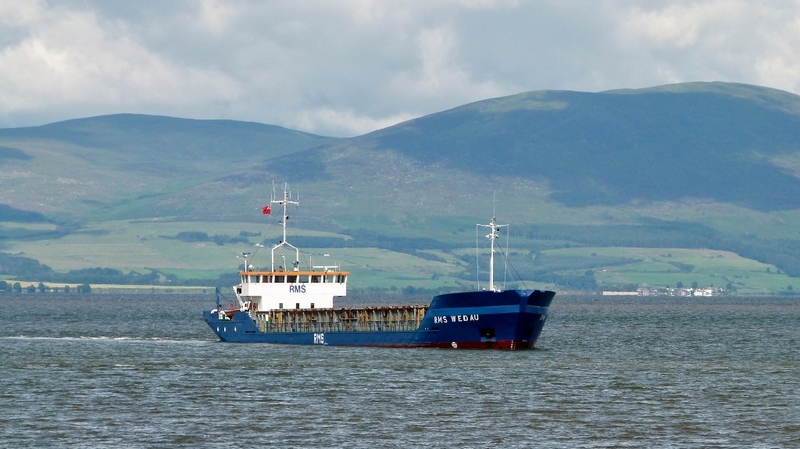 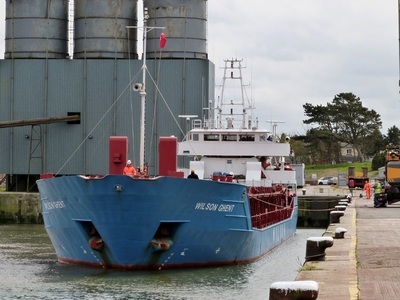 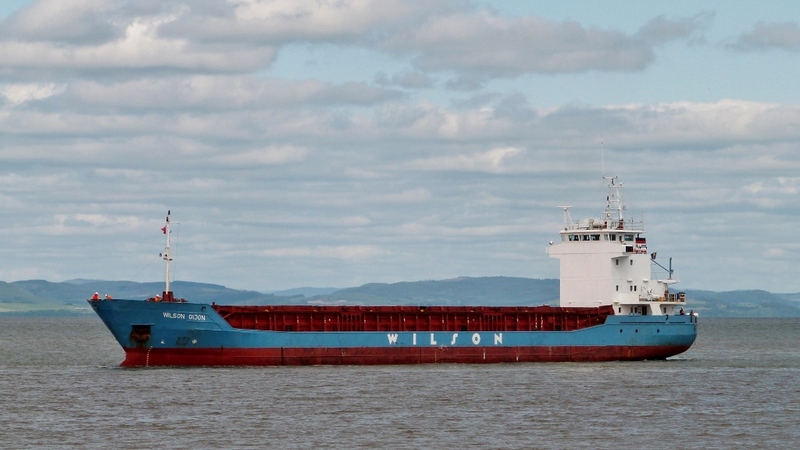 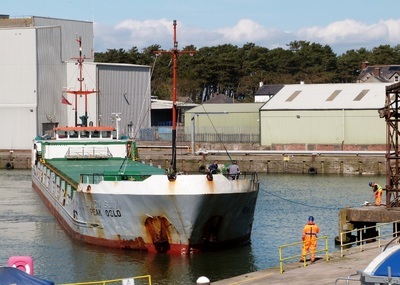 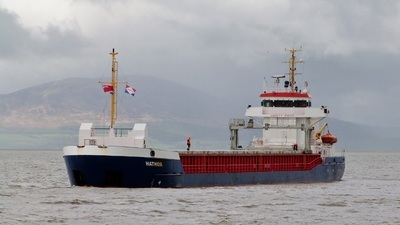 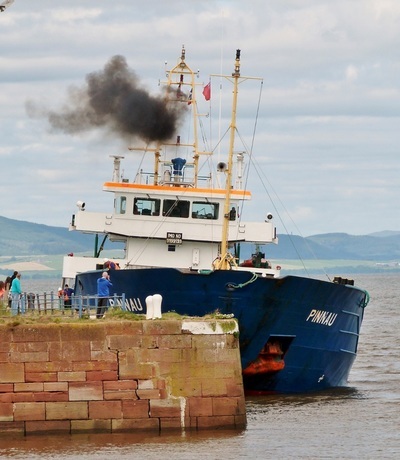 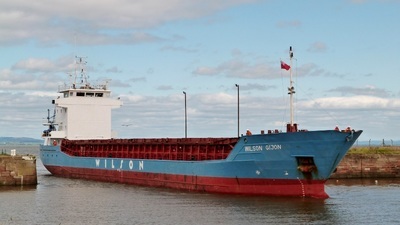 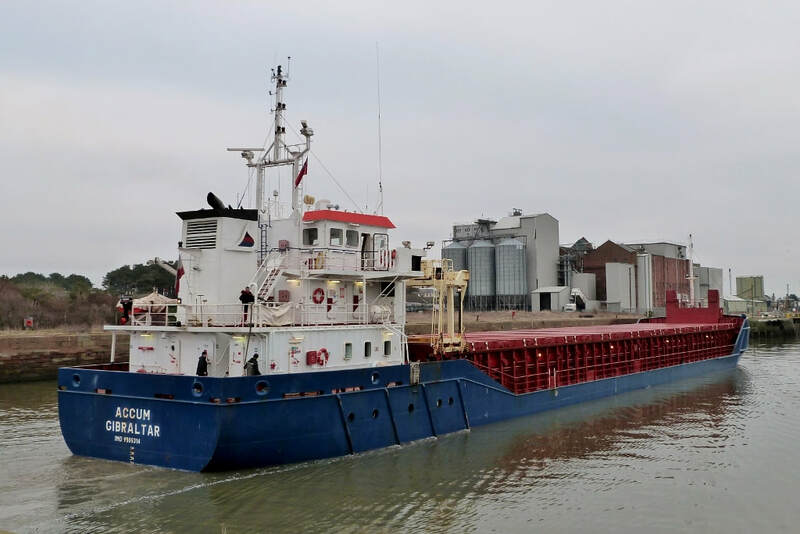 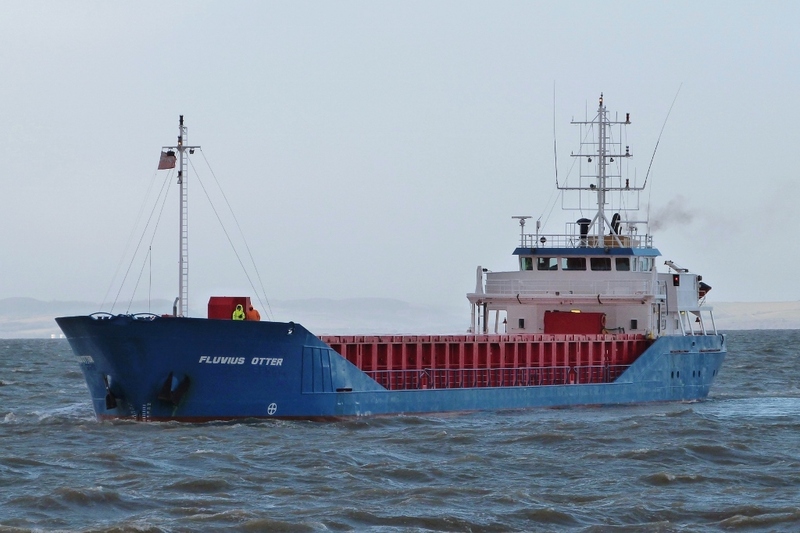 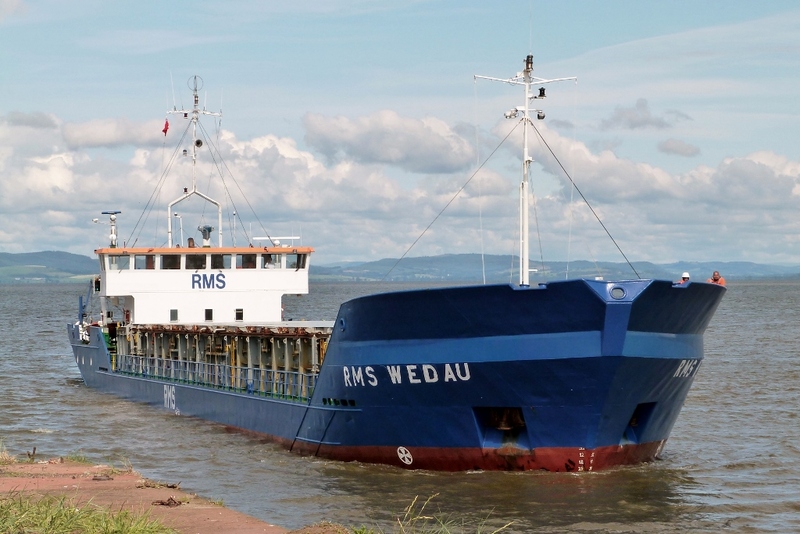 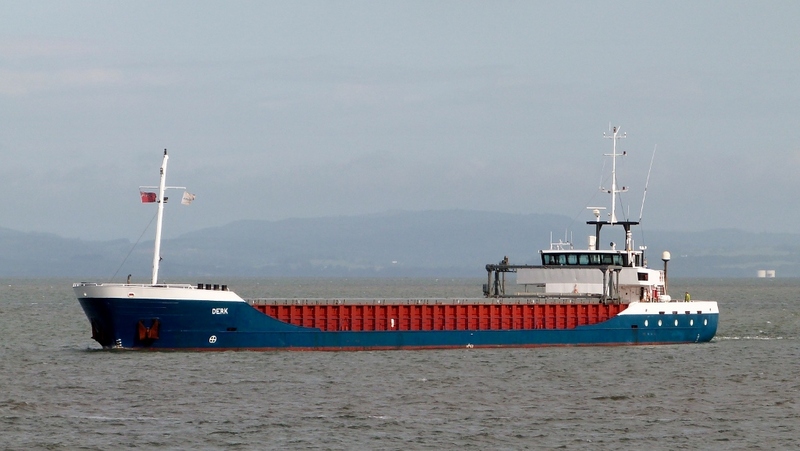 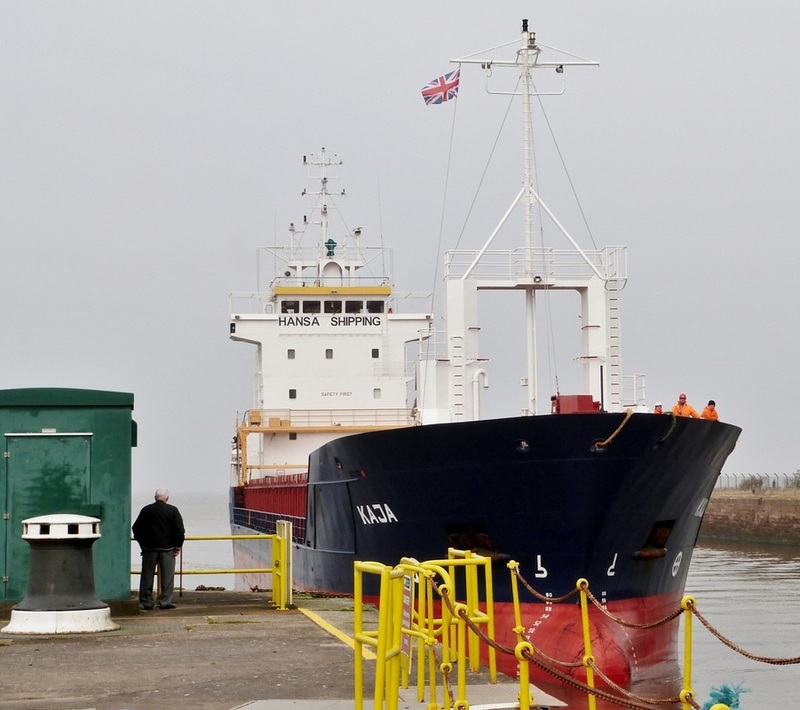 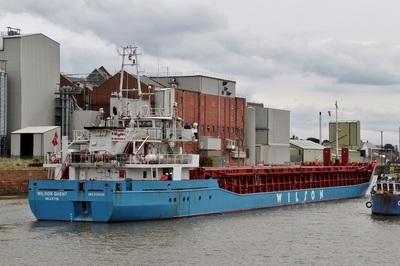 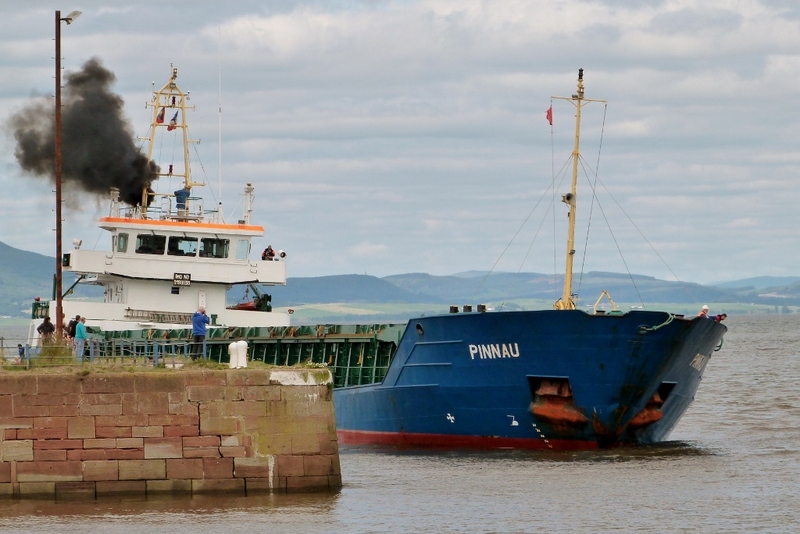 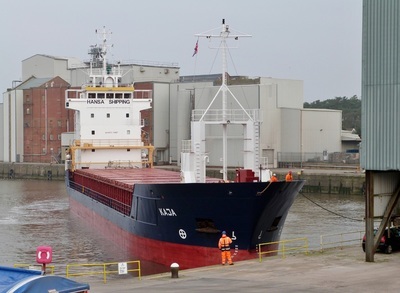 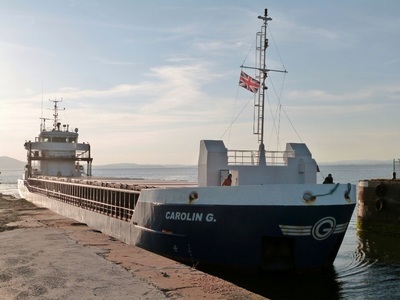 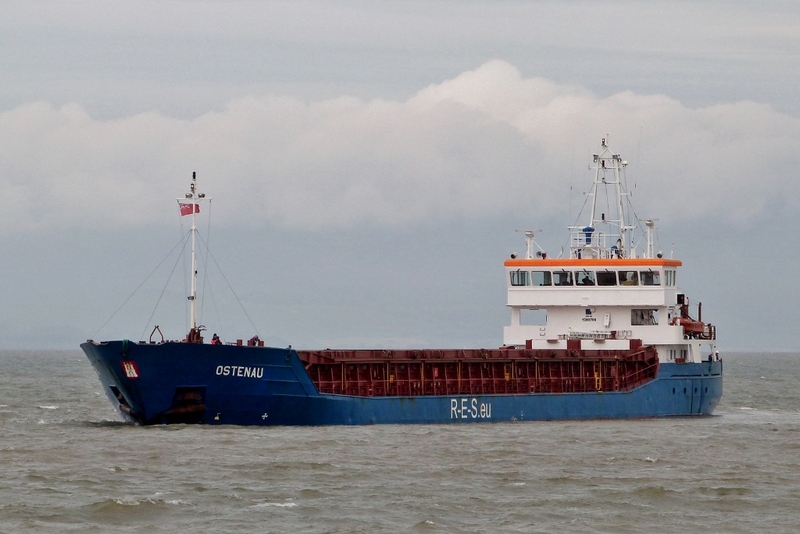 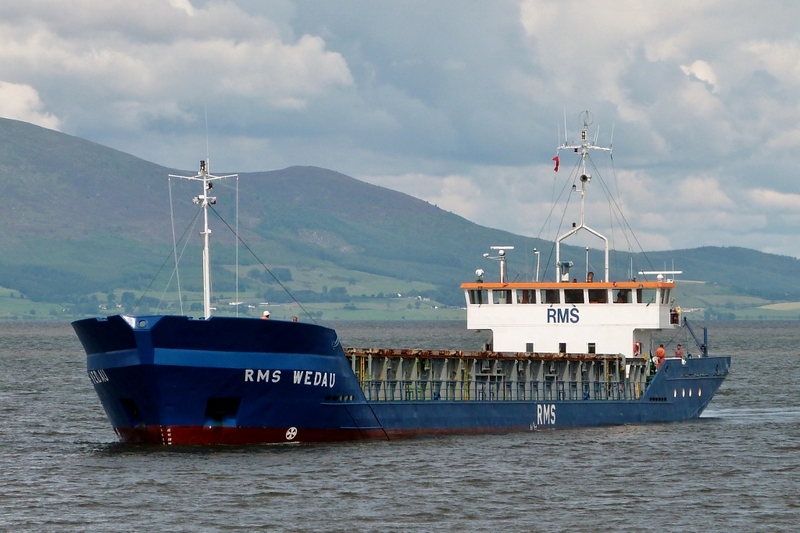 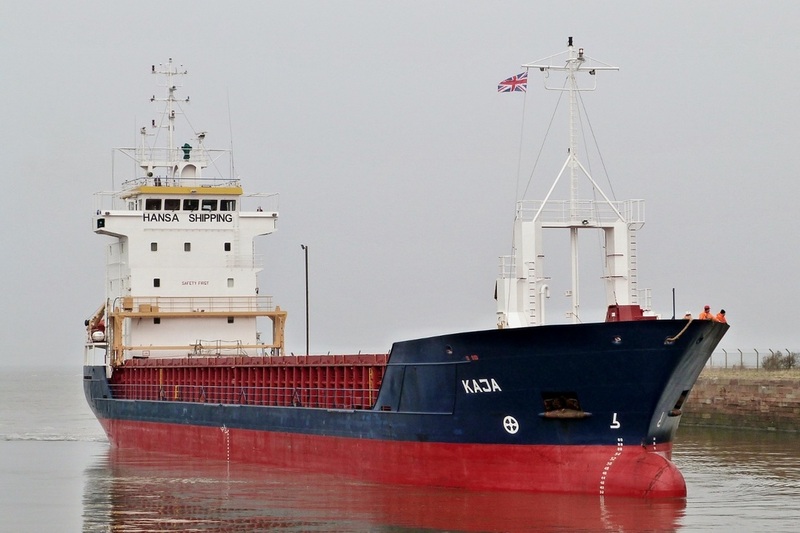 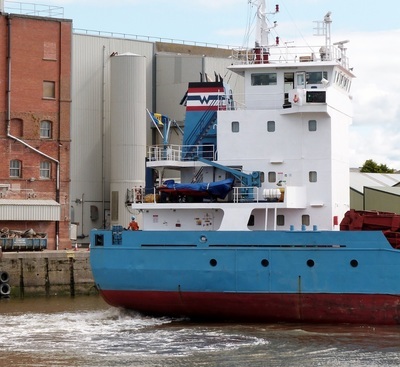 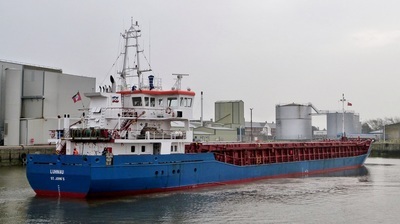 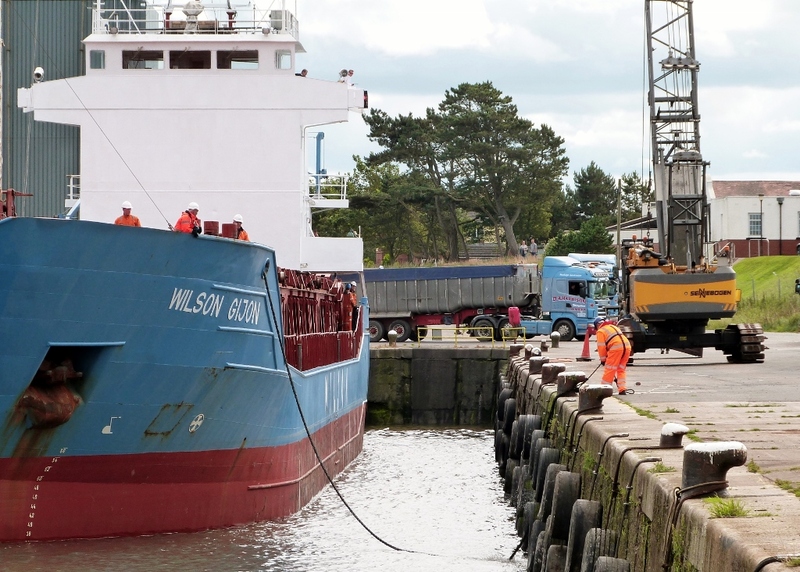 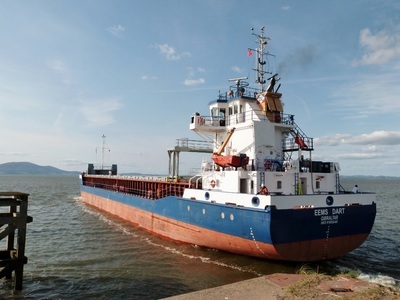 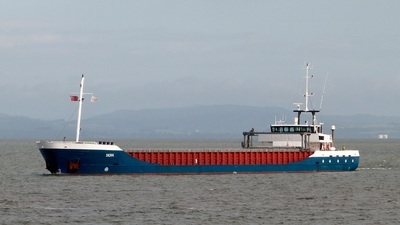 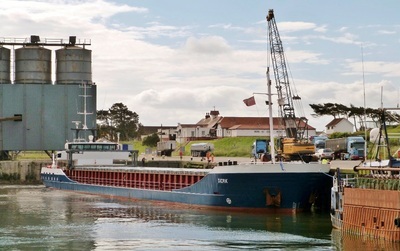 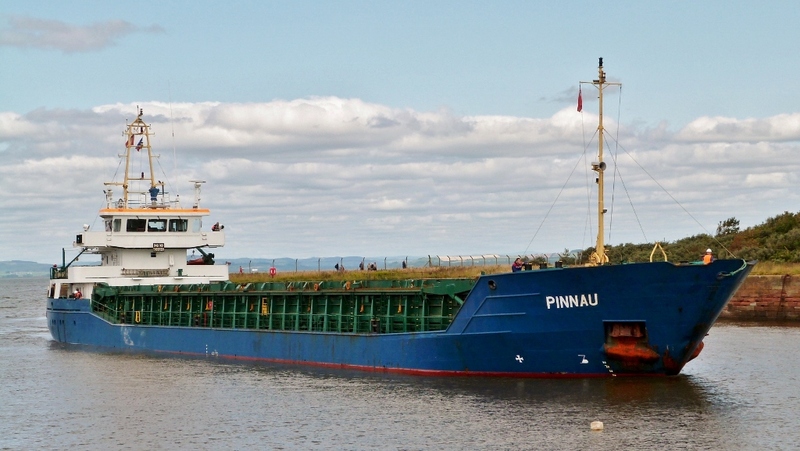 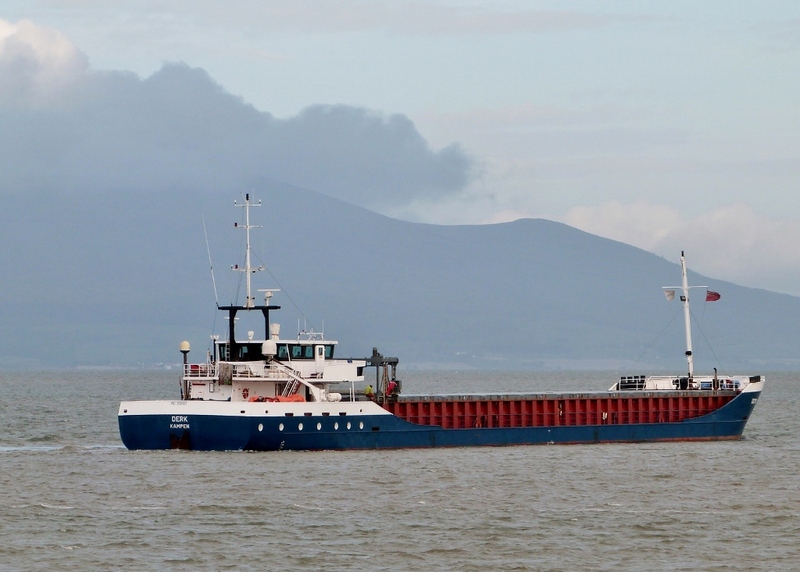 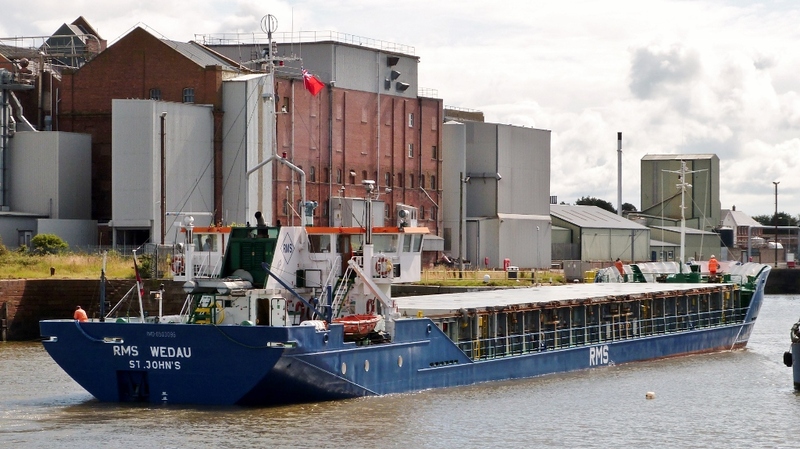 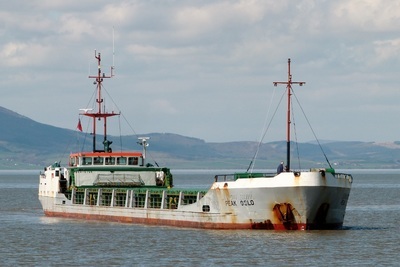 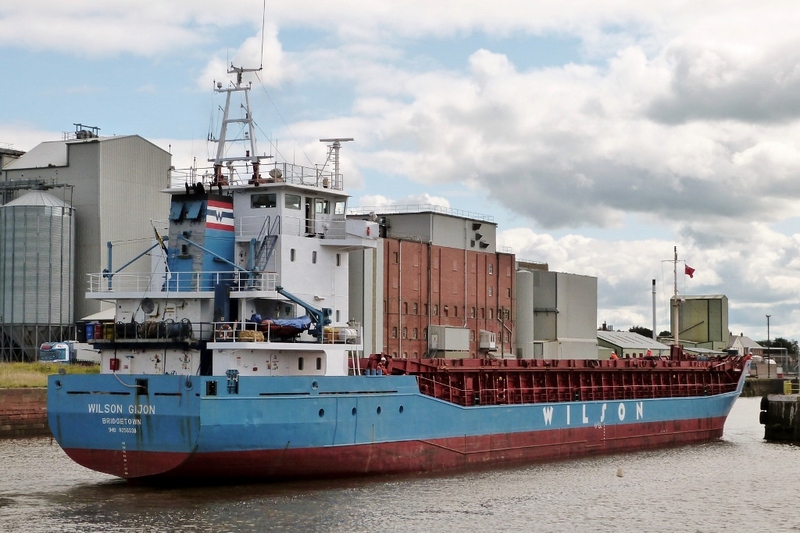 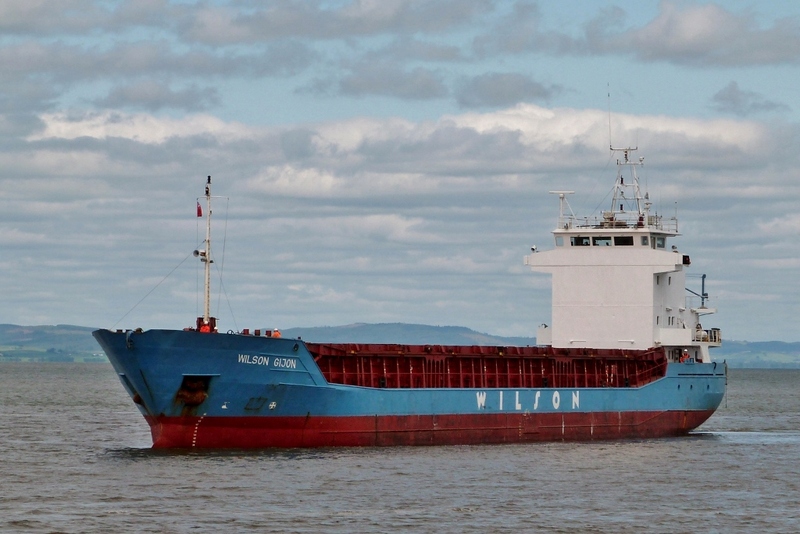 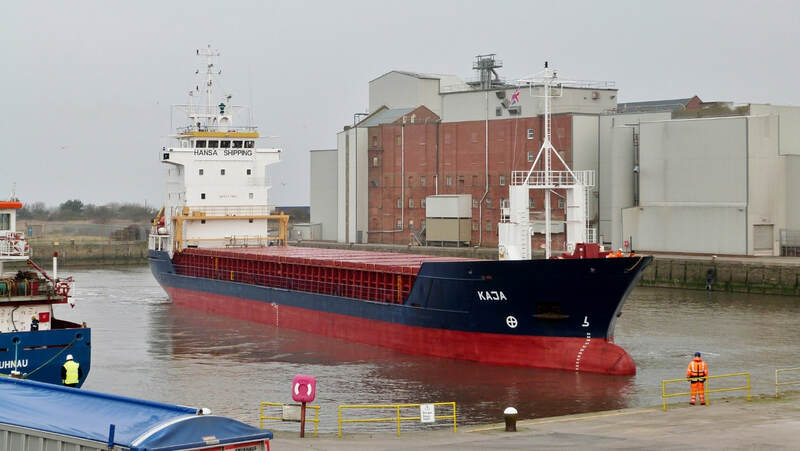 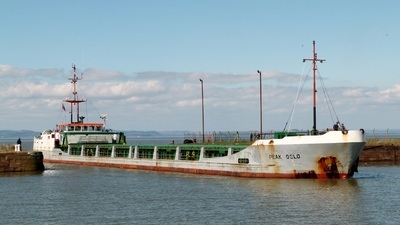 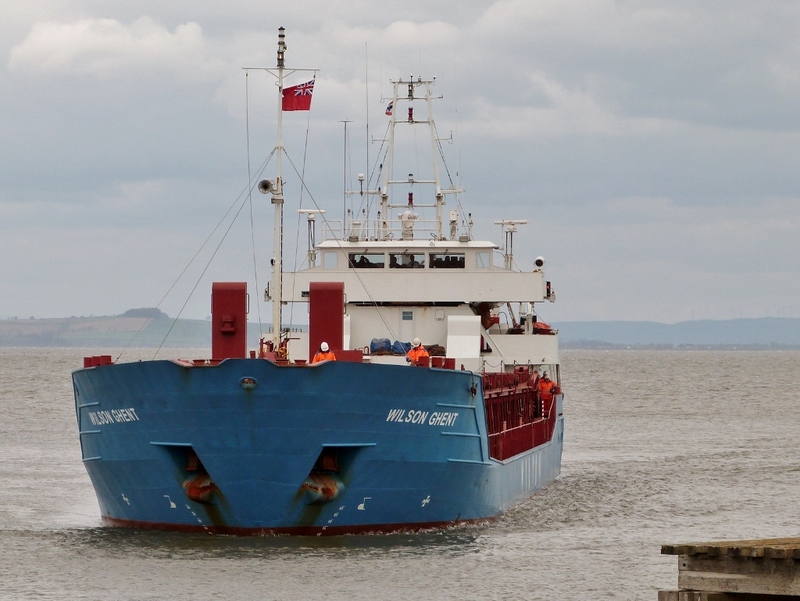 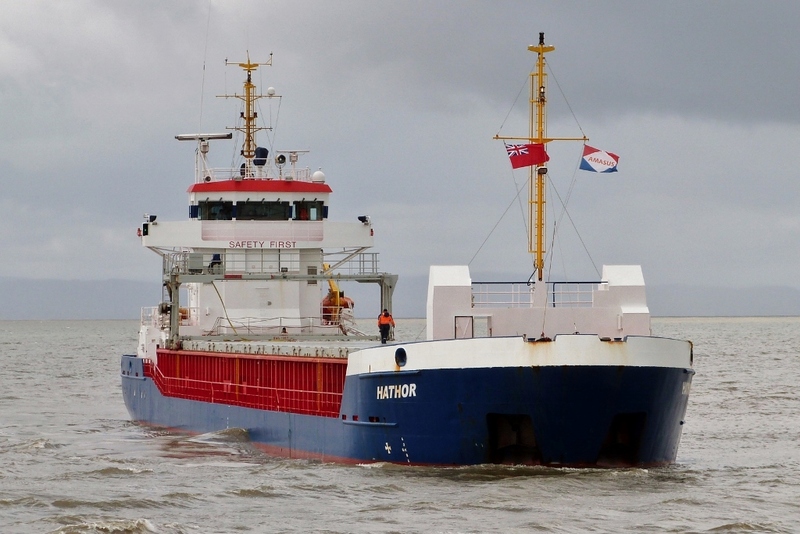 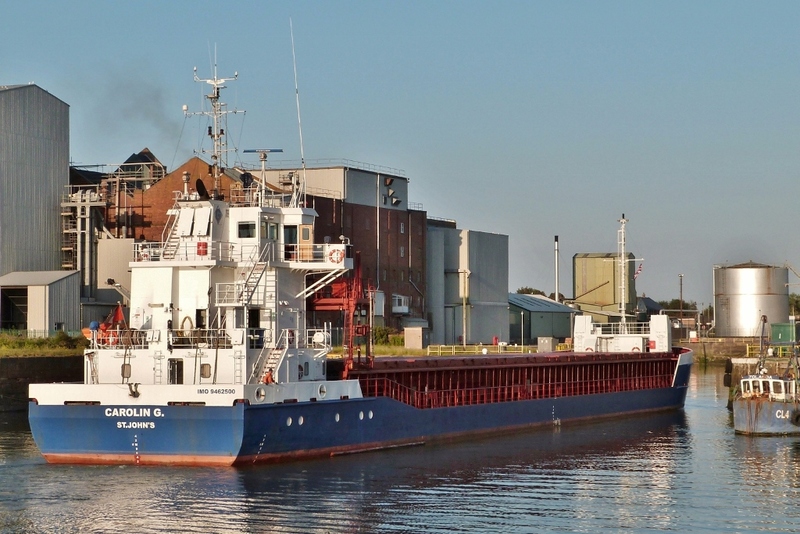 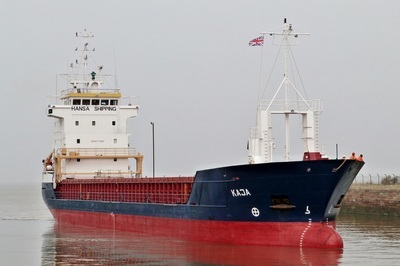 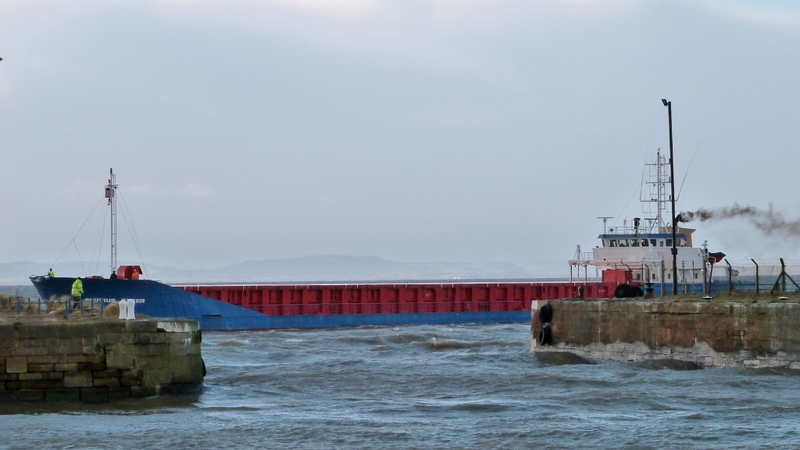 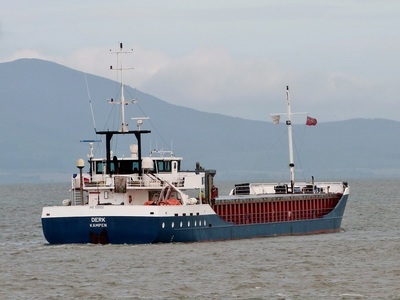 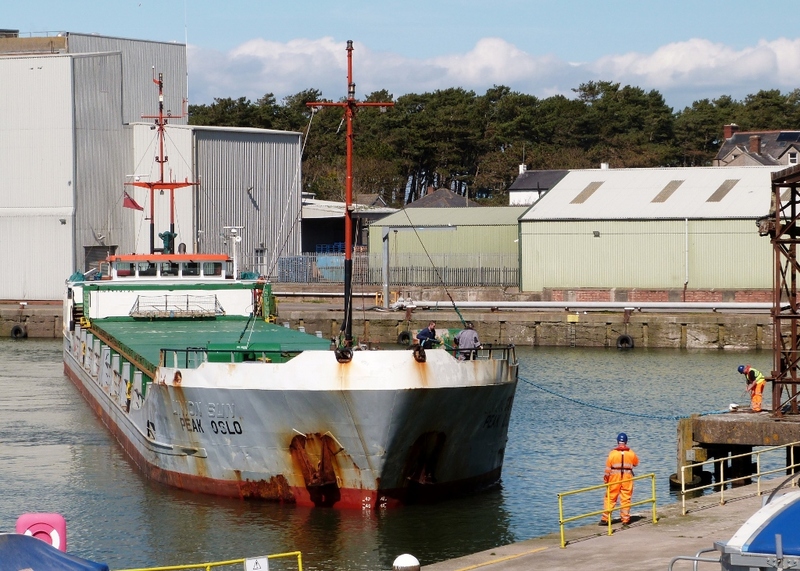 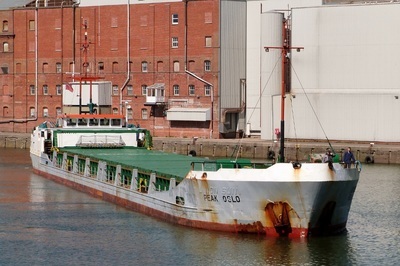 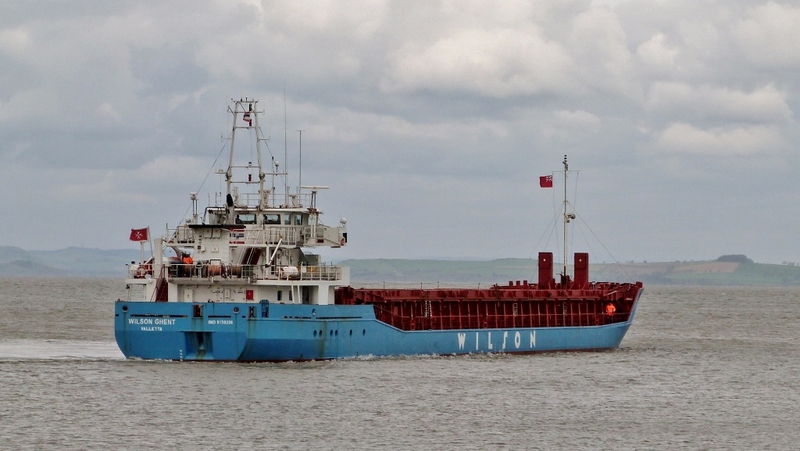 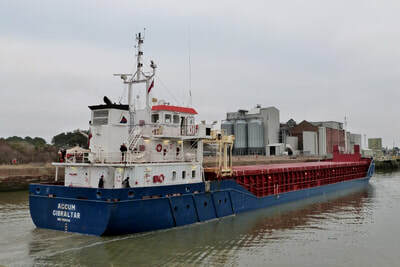 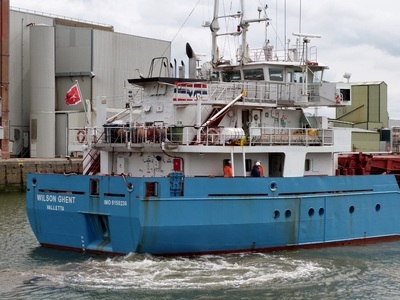 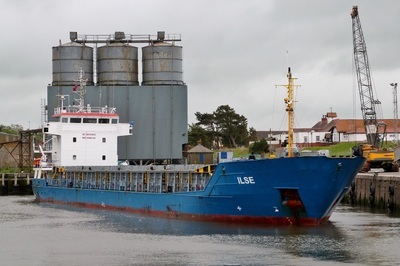 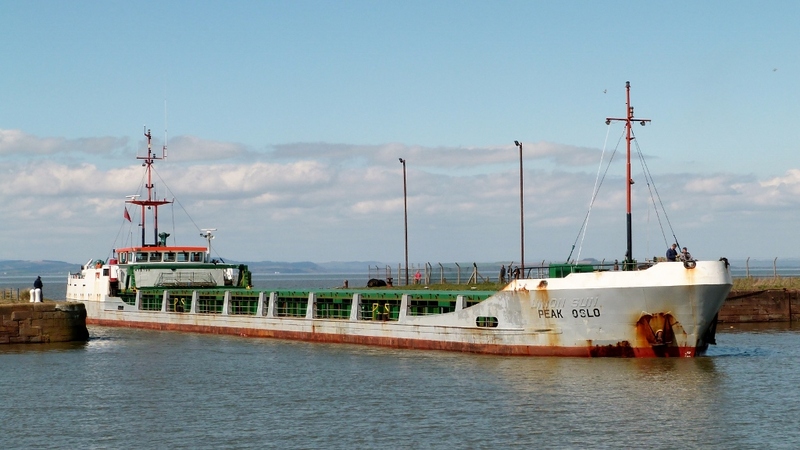 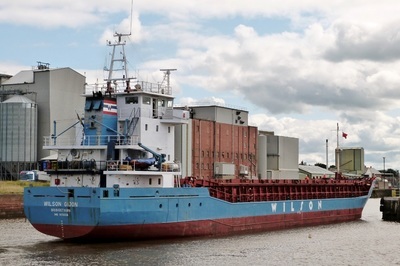 "Wilson Gijon" arrived from Lithuania, having discharged part of her cargo of fertiliser at Ayr, and docked first. "Pinnau" had made the short crossing from Kilroot, NI, with Furnace Bottom Ash. The approach began as the tide was beginning to ebb forcing the vessel off course at the outer dock entrance. Considerable skill was needed by pilot & crew to correct the situation. Inbound from La Pallice with wheat. The ship is 1 0f 15 belonging to 'Rhenus Maritime Services' of Duisburg. 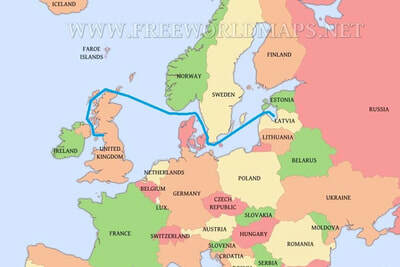 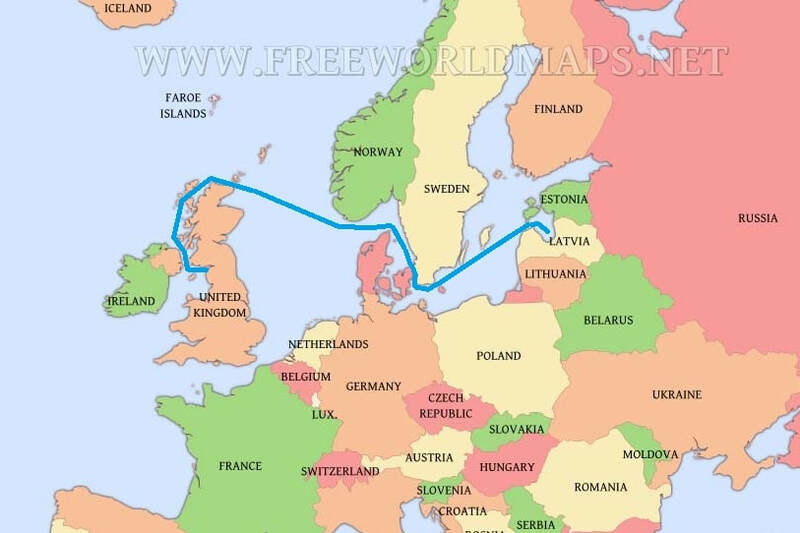 The company specialises in short sea/river European routes. 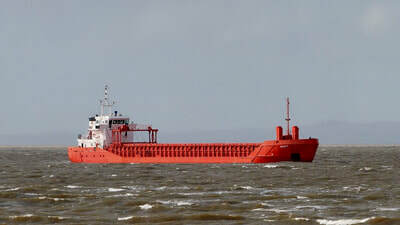 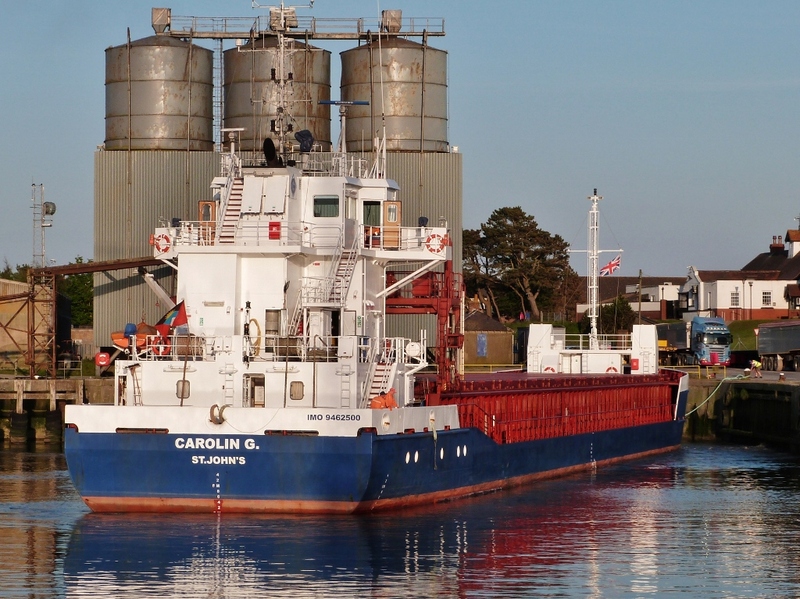 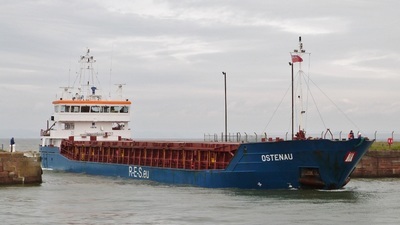 ​The 2,300ton DWT general cargo vessel was built in Germany as 'DANIA CARINA' in 1985. 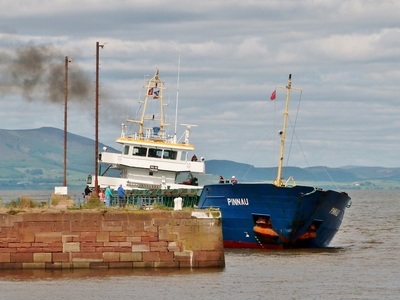 ​The ship was unloaded and ready to sail for Belfast on the following evening tide. ​La Pallice, situated on the Atlantic seaboard is the commercial port of La Rochelle, a major grain exporter & second only to Rouen. 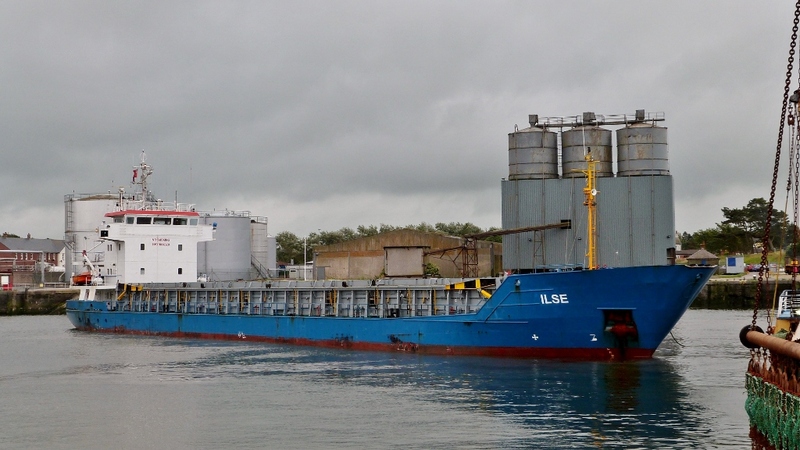 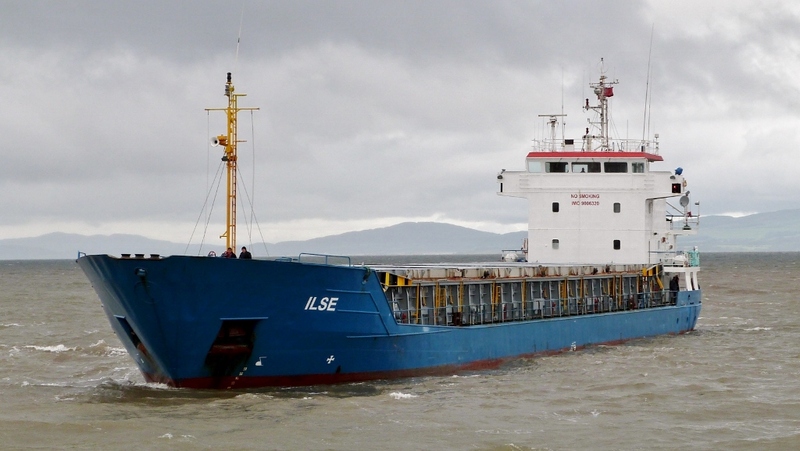 ​​"ILSE" is a 3,700ton DWT general cargo carrier built in 1993 & registered in Malta. 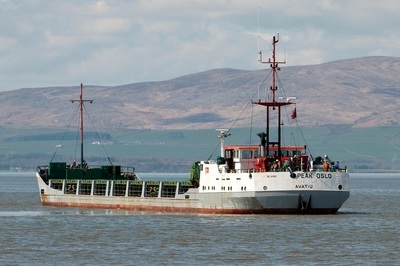 She is 1 of 4 ships owned by 'SHIPFIN' of Switzerland. 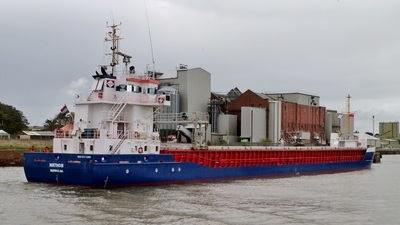 Inbound with fertiliser from Ghent, Belgium. 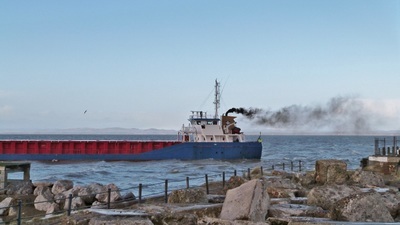 Photos were taken from the north pier rather than the usual south to gain advantage of the early morning (8am) light. It's only when manoeuvring inside the New Dock that the skill required to turn the vessel within a tight space can be appreciated. 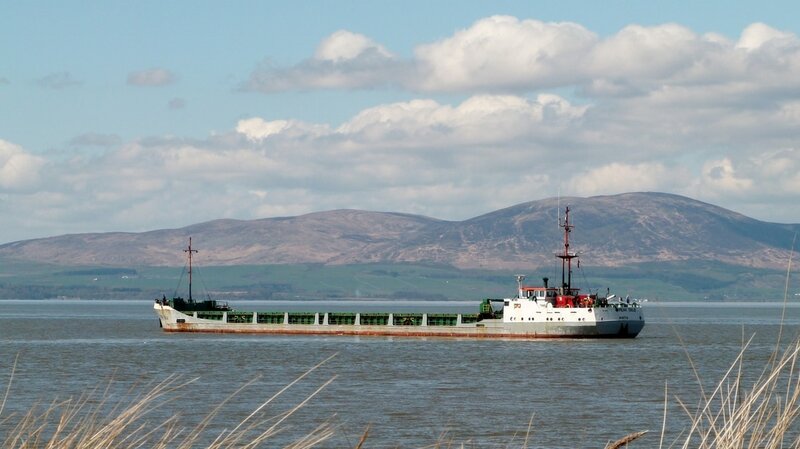 Inbound with 'furnace bottom ash' from Kilroot Power Station, NI, for use in the construction industry. 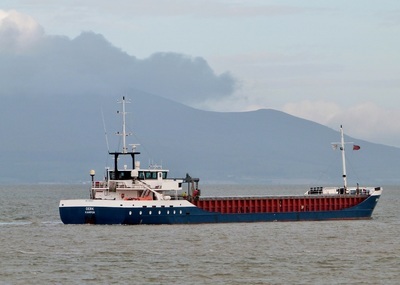 The ship belongs to 'Strahlmann Shipping' whose vessels work regularly in the Irish Sea. The port of registry is St.John's, the capital of the Caribbean islands Antigua & Barbuda - a region with historic links to the British Navy. 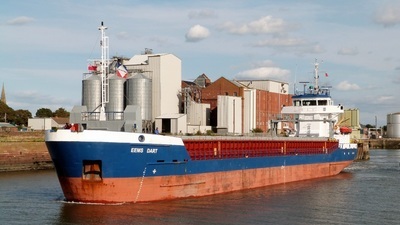 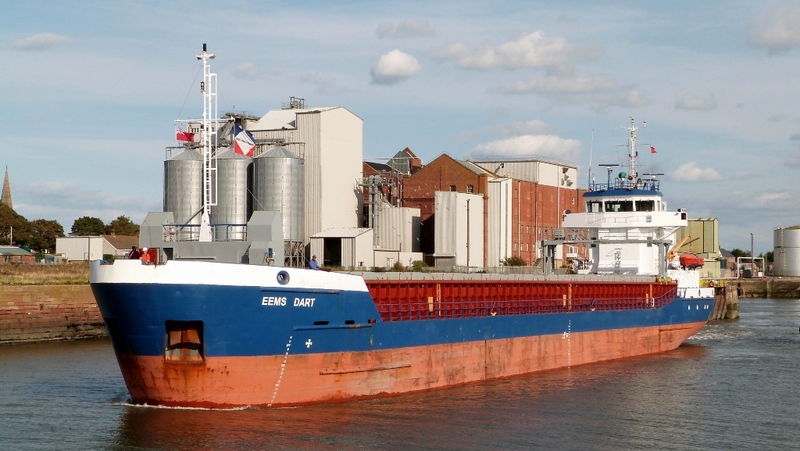 Inbound on a sunny June evening with a full load (3,300ton) of wheat from the French port of La Pallice. 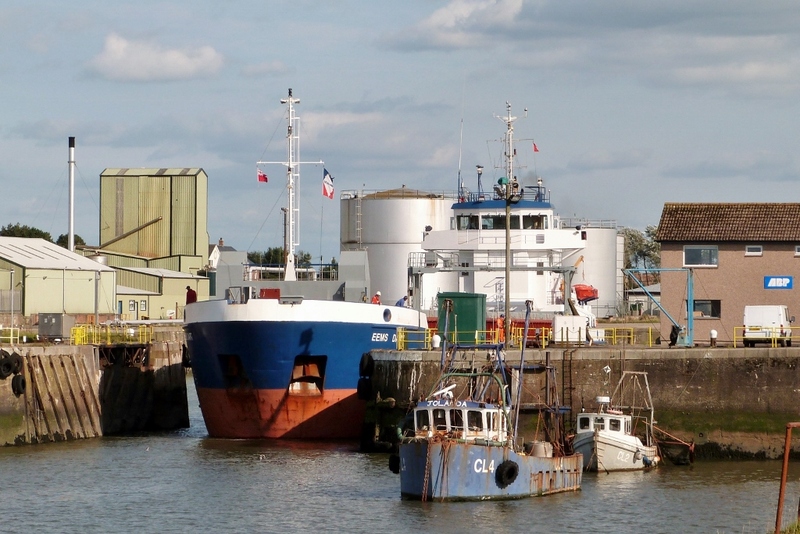 ​The port is a major exporter of grain, second only to Rouen, & the only deep-water port on the Atlantic coast. ​The 3,800 ton DWT vessel is 1 of 14 owned by 'Gerdes Shipping' of Germany. 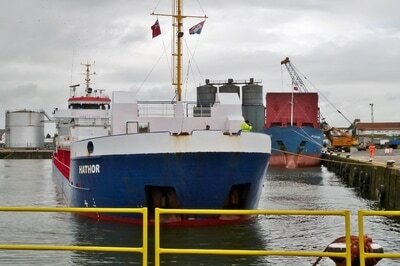 Unloaded & awaiting orders. 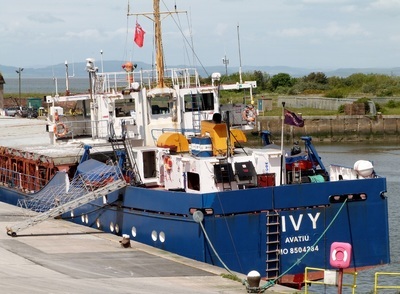 "IVY" had arrived from Sibenik, Croatia, after an 18day voyage, one of the longest to reach the port in recent years. 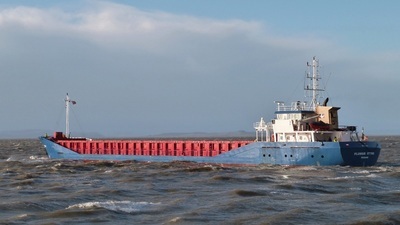 The expected arrival time had been extended by stormy weather off Cape Finisterre where she had sought shelter for two days. 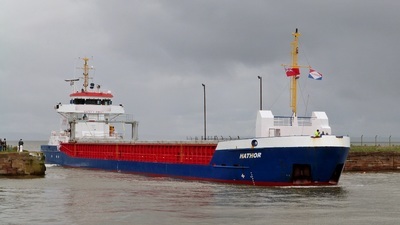 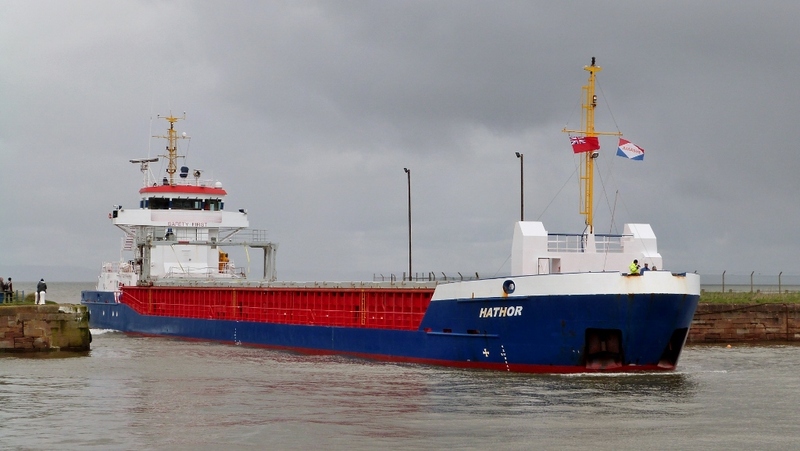 Inbound from St.Nazaire, France with 3,300ton of wheat on the early afternoon tide. 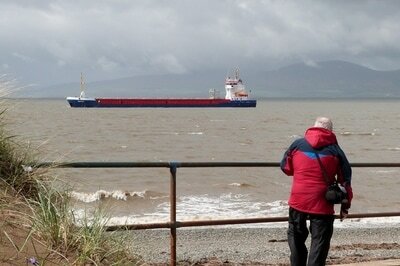 ​An attempt to dock the previous day had been aborted & the ship waited at anchor off Workington. 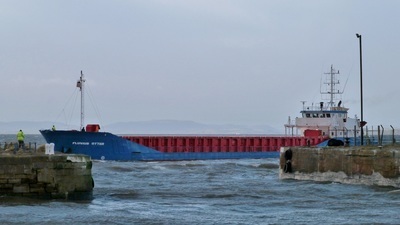 This arrival also proved difficult with the vessel appearing to overshoot the dock entrance. 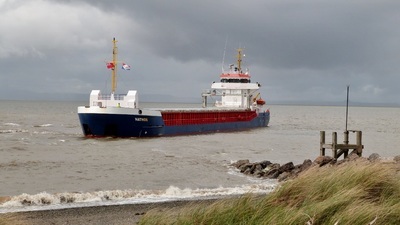 She was able to regain position and make a successful entry. 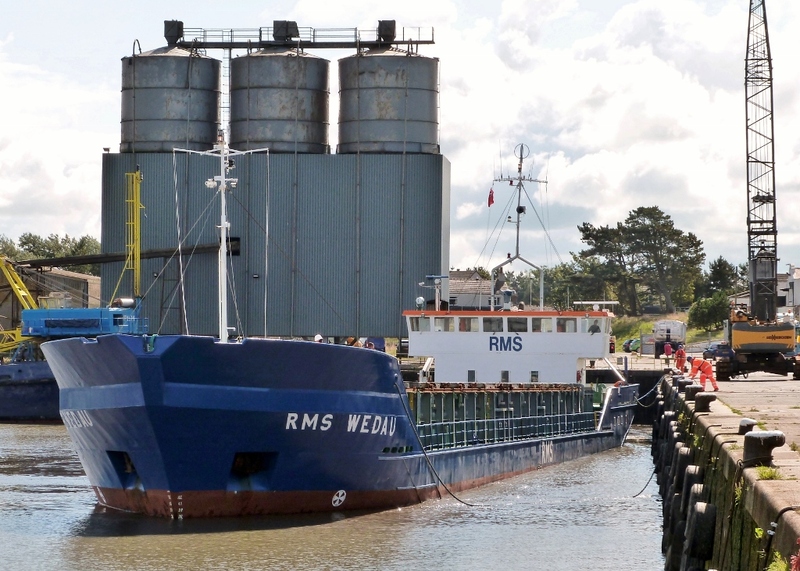 Inbound from Klaipeda, Lithuania with 3,000ton of fertiliser. 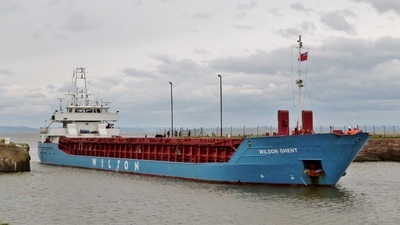 ​'WILSON GHENT' is owned by the Norwegian 'WILSON' group. 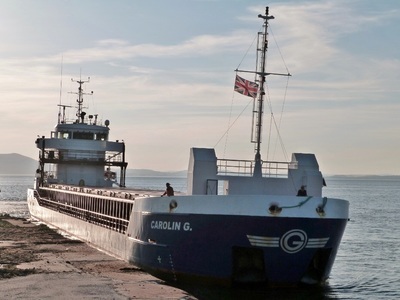 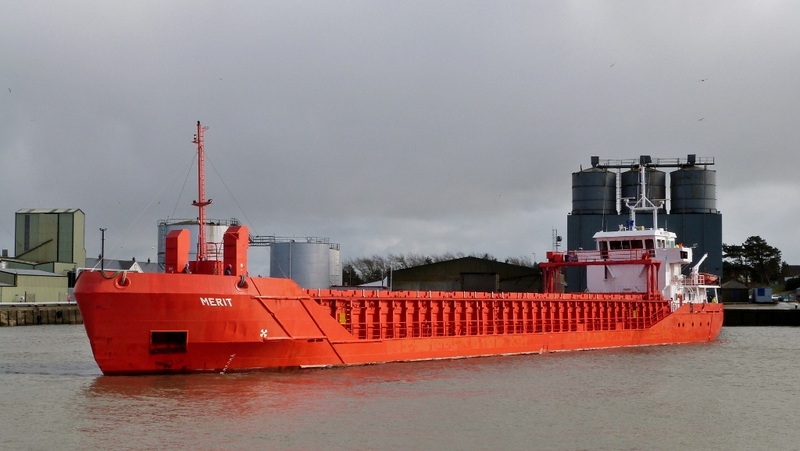 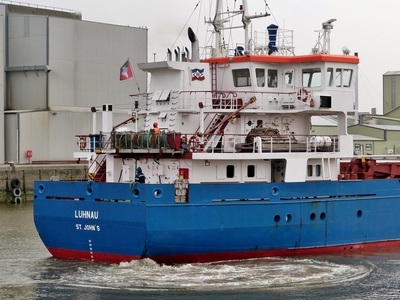 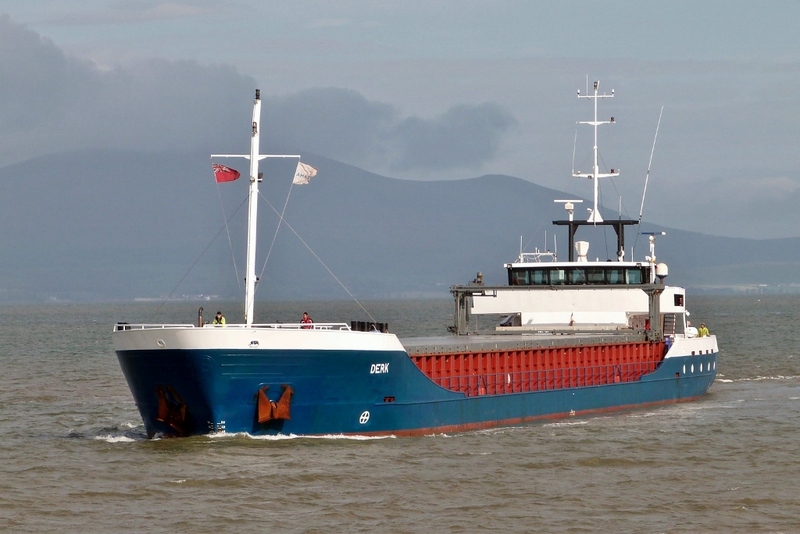 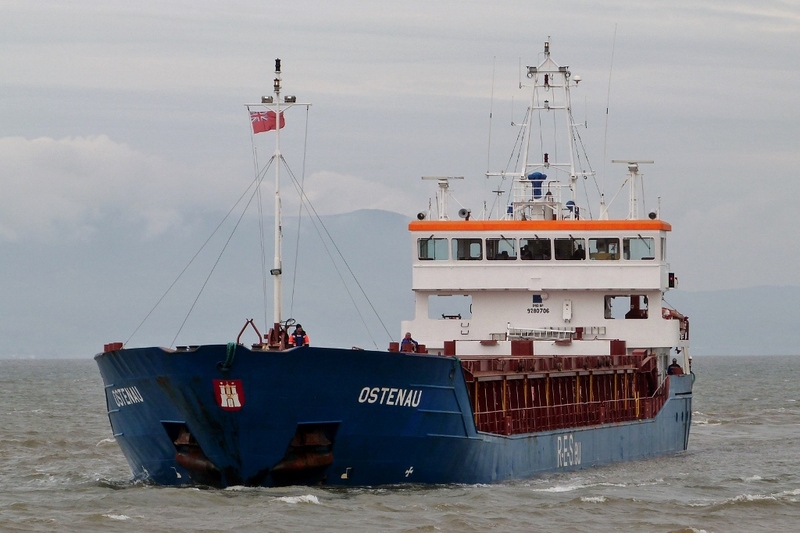 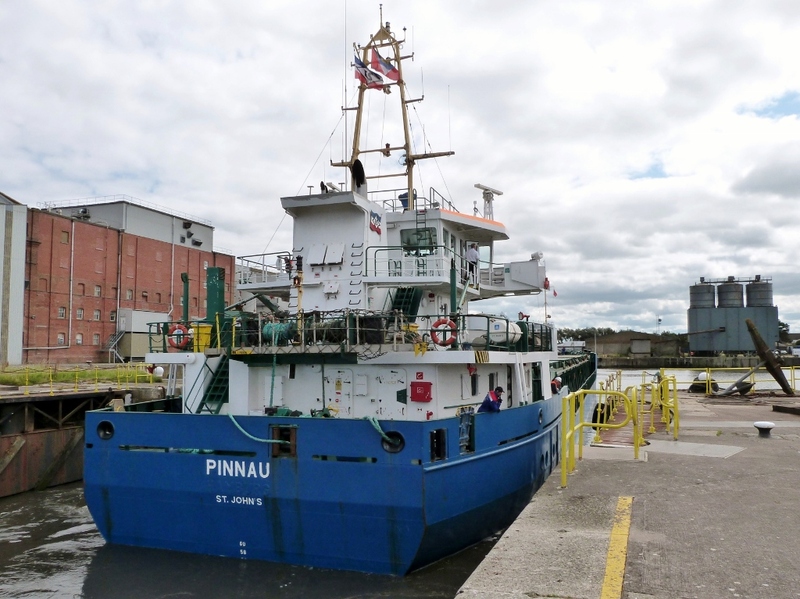 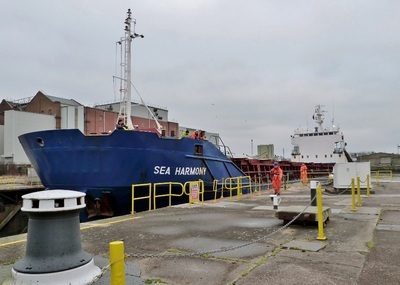 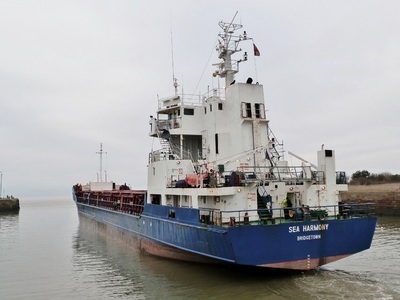 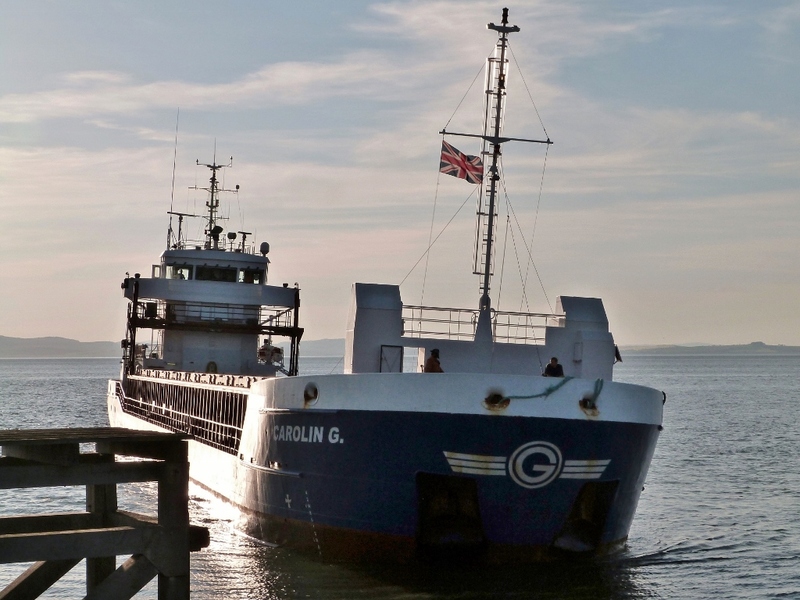 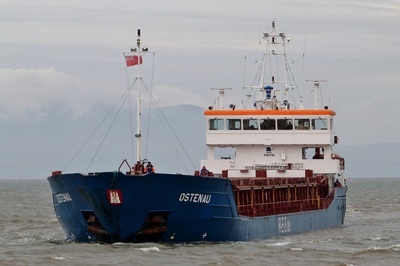 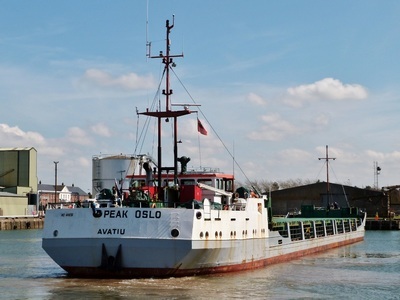 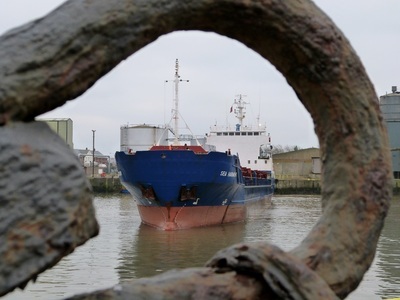 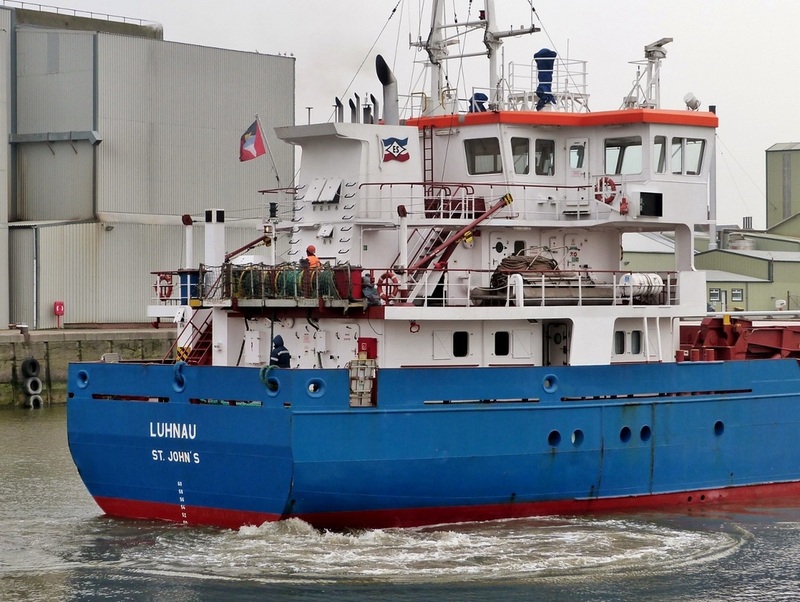 It's one of a fleet of more than 100 vessels specialising in short sea trade. 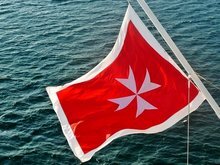 ​The merchant Maltese cross is flown - the port of registry being Valletta. ​Malta has a long maritime tradition & is amongst the largest registries in the world in terms of tonnage. ​Inbound on a bright spring lunchtime with wheat from the German port of Vierow. 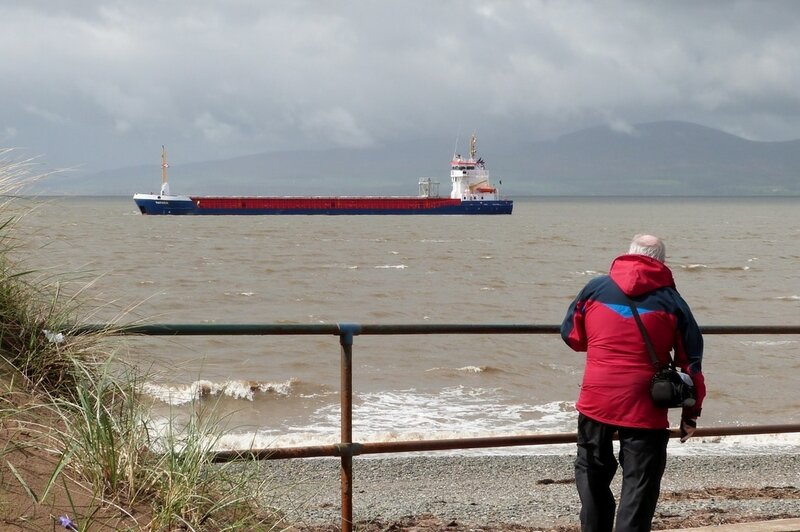 Visibility is exceptional with fine views of green Scottish pastures across the Solway. 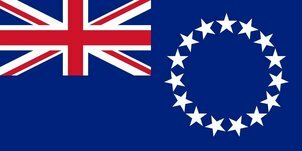 She is registered in Avatiu, a region of the Pacific Cook Islands which have a close association with New Zealand. 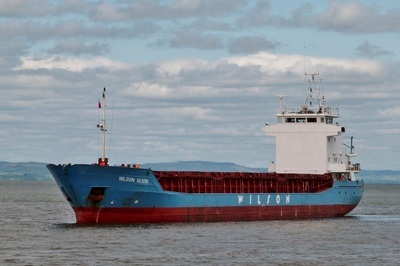 ​The 2,400ton DWT vessel was built in 1985 as the "UNION SUN". 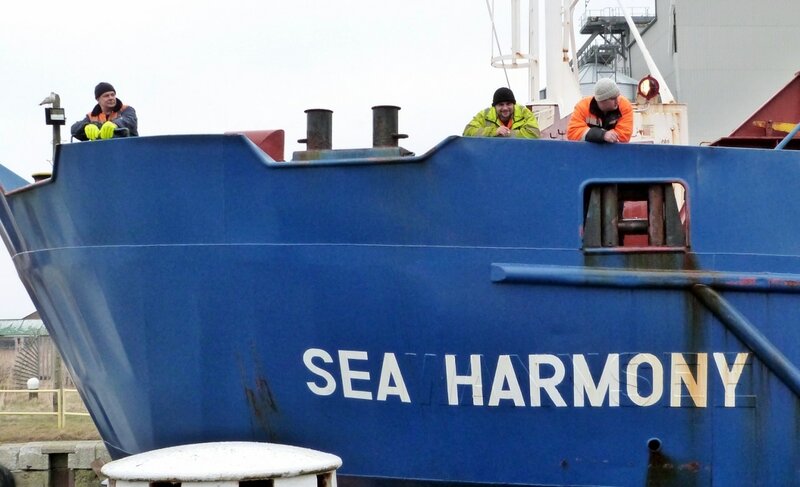 ​The original name is still visible on bow & stern. 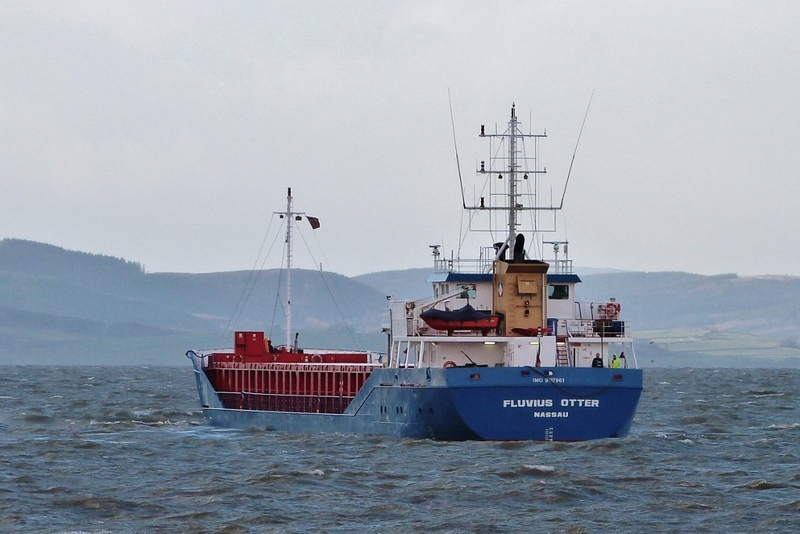 The vessel is equipped with a 'Water Jet Bow Thruster' & 'Schilling Rudder' for high manoeuvrability in tight spaces. Inbound from Klaipeda, Lithuania with fertiliser. 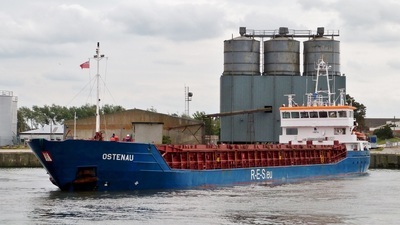 This was the fourth visit since 2011 for the 'Strahlmann' regular. On this occasion she had been anchored off Workington for 4days unable to dock due to neap tides. A disappointing day for photographers with murky conditions for the early morning arrival. KAJA is manoeuvred towards a temporary berth at the east quay. 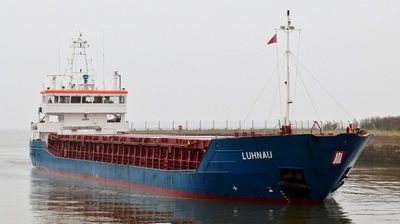 It was the second arrival of the morning and 'KAJA' had to be held at the New Dock entrance until 'LUHNAU' was safely berthed before proceeding. The logo of the Estonian owner 'HANSA SHIPPING' is prominent on the superstructure. 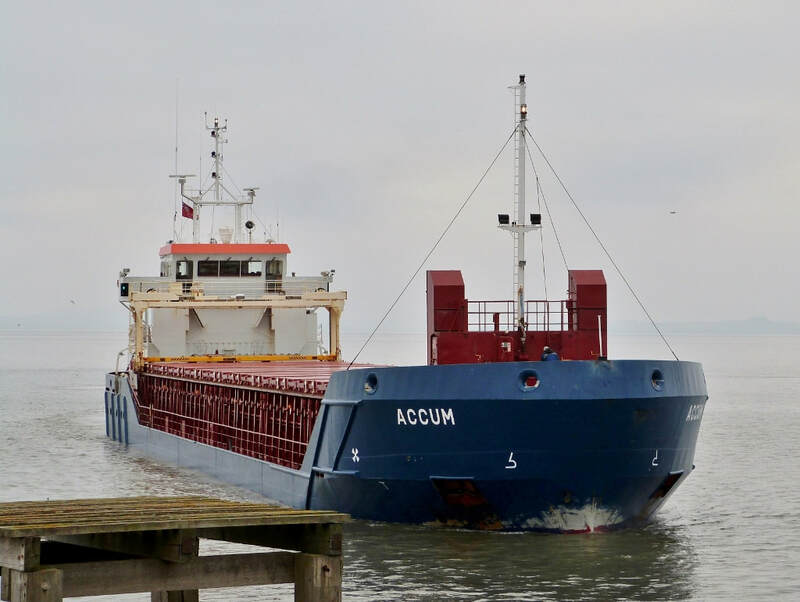 ​In addition to details of the fleet, the website contains an interesting map showing current ice conditions in the Baltic. 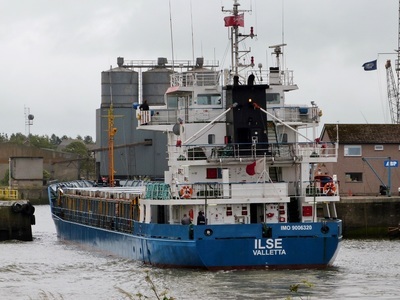 Seen arriving from La Pallice, France on a blustery Spring afternoon. 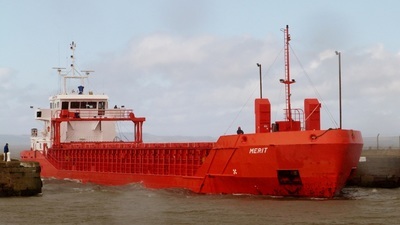 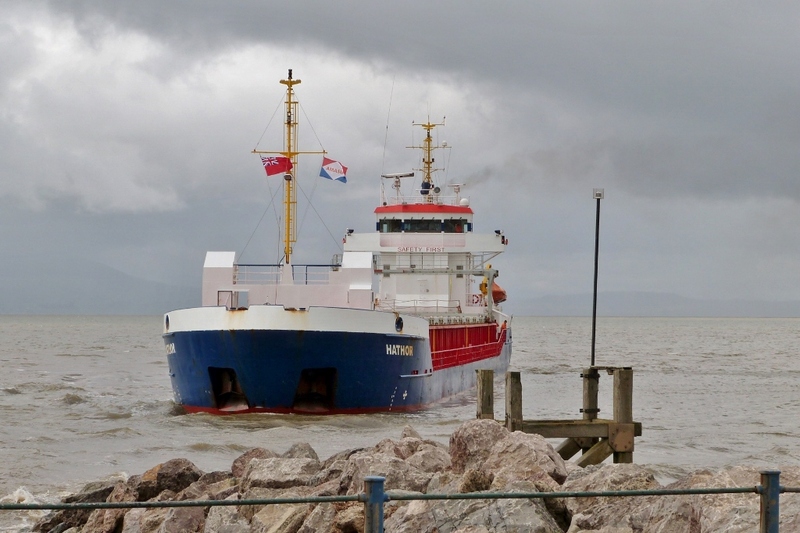 ​'MERIT' had sought shelter from the storm in Ramsey Bay for 36hr before conditions improved enough for her to dock. Even so, it was a mixture of sunshine & showers for her arrival & the heavens opened as she entered Marshall Dock; the worse possible time for the photographer. 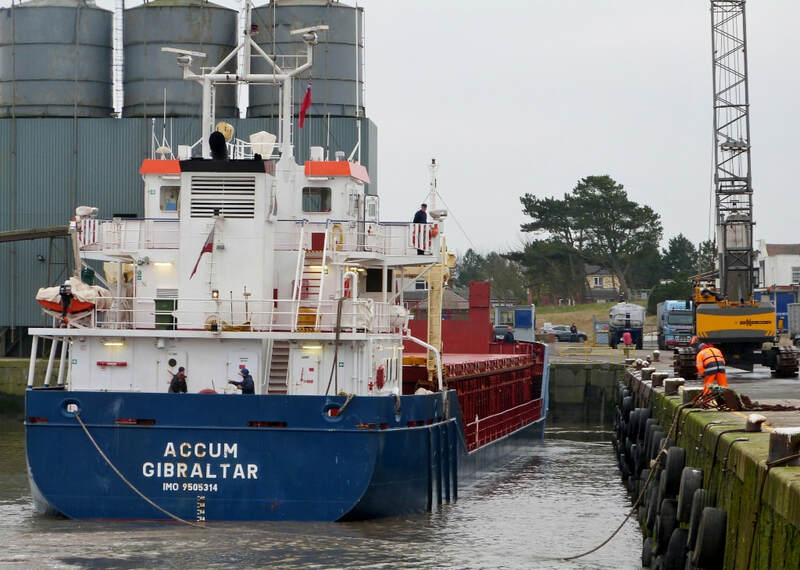 ​The 3,100ton DWT coaster, registered in Gibraltar was built in Romania in 2000. 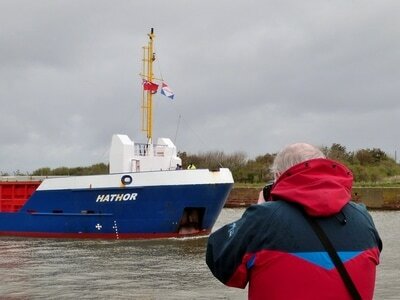 ​She carries the funnel logo of the German ​'Fahrdorfer Shipping' company. 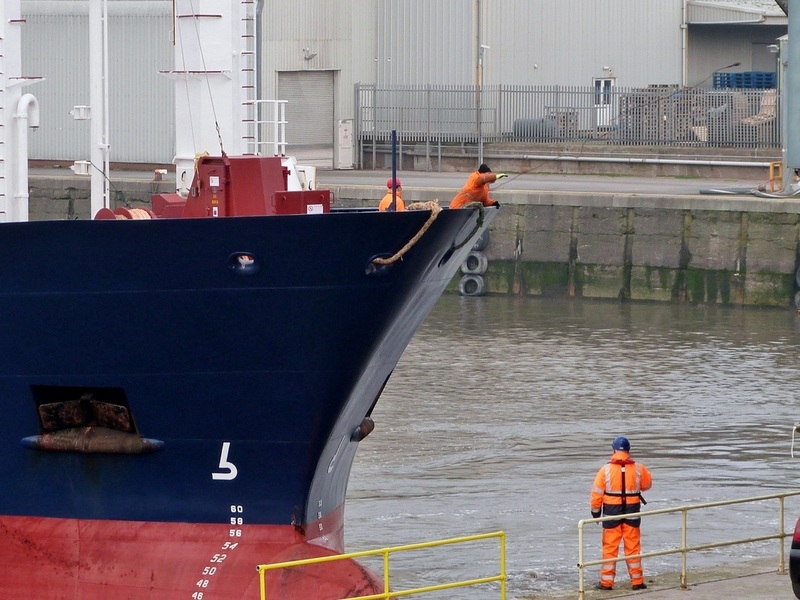 Seen making an aborted attempt to enter dock. Frustrating times as she had already spent 36hrs at anchor in Ramsey Bay sheltering from the storm. 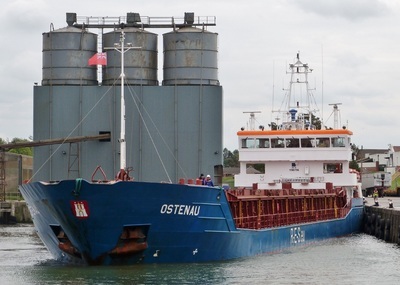 However, she was successful on the next tide & was able to unload her cargo of 3,000ton of fertiliser from Ghent. 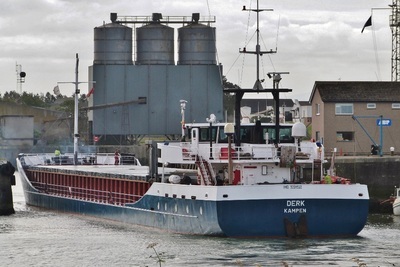 The 3,200ton DWT coaster started life as 'ARKLOW SPRAY' in 1996. 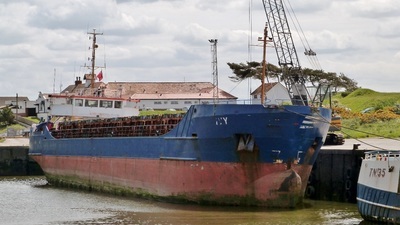 ​She has had two previous owners before her current one, ​'EXE Shipping'. 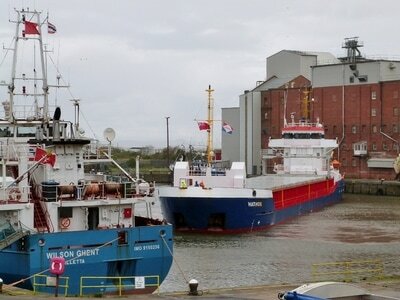 ​The vessel is 1 of 9 owned by 'Blair & Gillie' of Newcastle Upon Tyne, a company with over 100yrs in shipping. 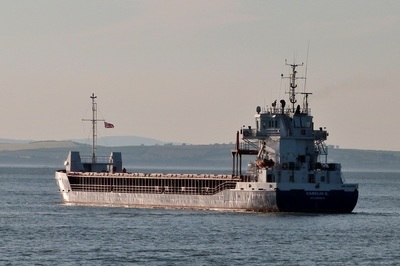 She was built in 1991 in Portugal as 'WANNSEE'. 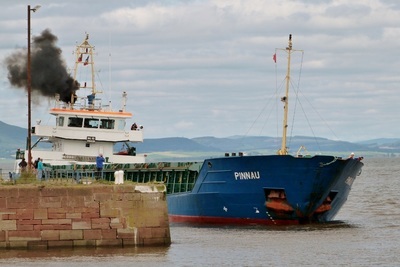 Since then she's changed hands many times and had nine name changes. 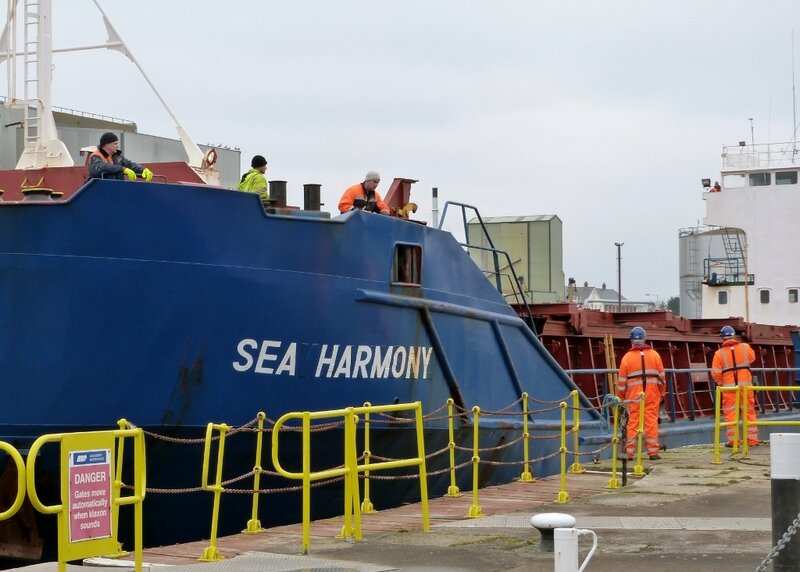 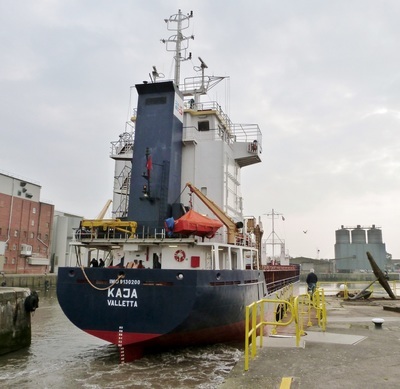 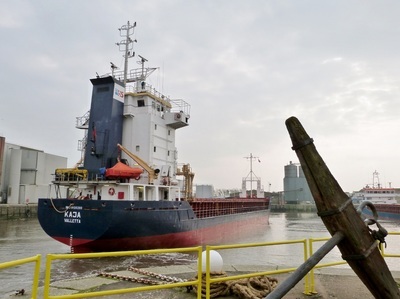 ​​The crew look pleased to be on their way after discharging a cargo of fertiliser from Antwerp. 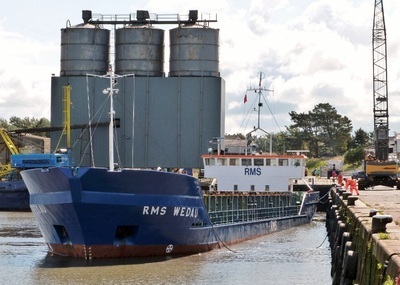 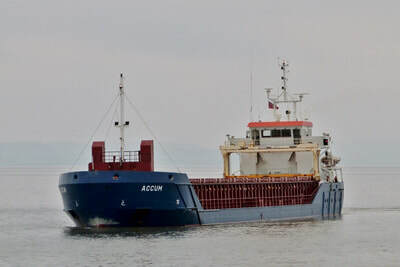 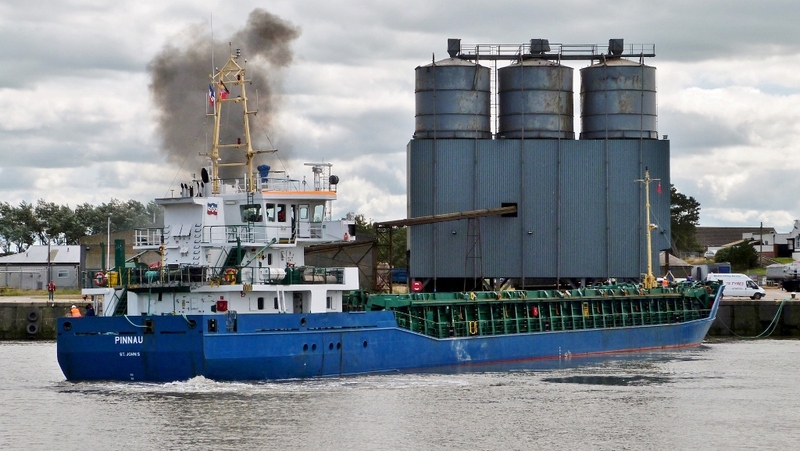 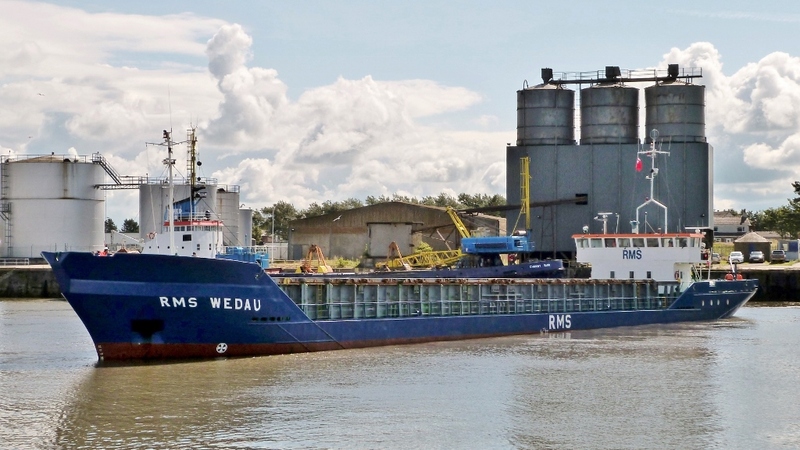 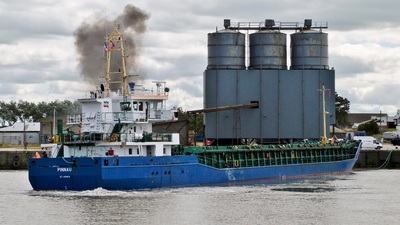 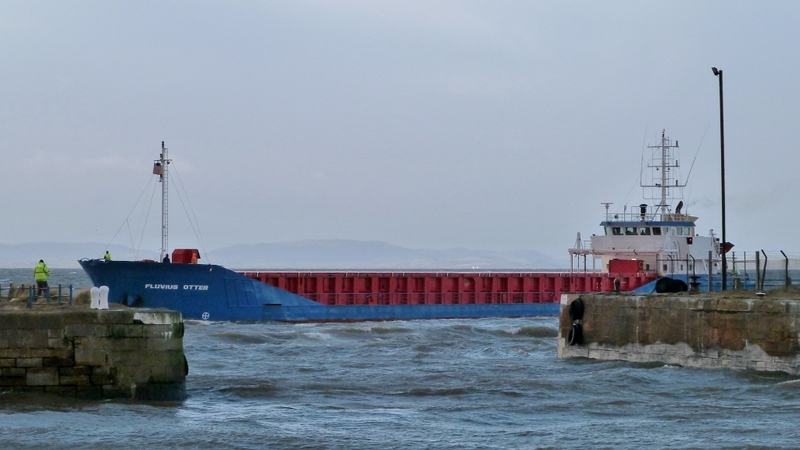 ​'ACCUM' was built in Vietnam in 2010 & carries the funnel marking of 'BRIESE Shipping' of Leer, Germany. 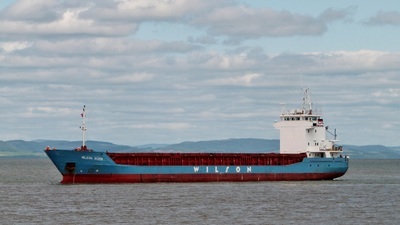 She is one of the smaller vessels of a fleet of 130.